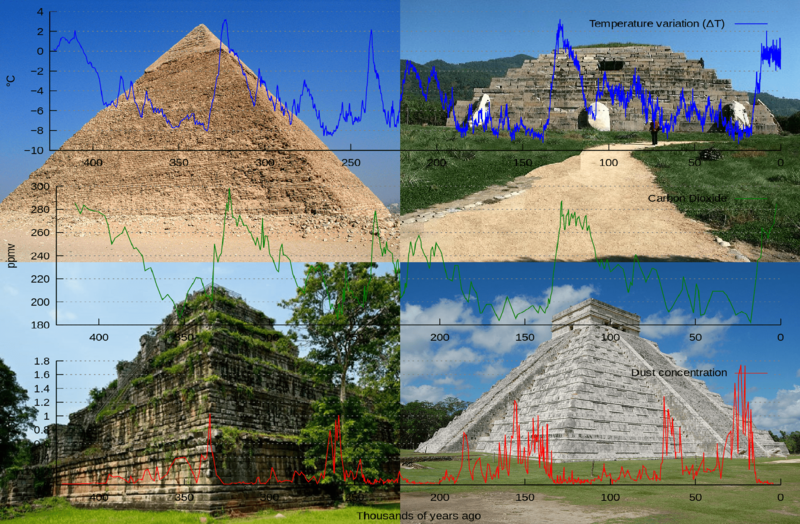 Orientation patterns of more than 910 ancient pyramids, sites, and temples, randomly spread around the world, correlates with the temperature changes of the last series of glaciation cycles. Most ancient monuments are hundreds of thousands of years old. Renovations of ancient monuments were done on top of their much older foundations, leaving most of the original orientations intact. The orientation of ancient monuments is, beyond any doubt, a very potent mathematical data analysis tool, revealing an astounding, inescapable truth. Fig 1: There is an overwhelming correlation relation between the orientation of ancient structures and the waxing and waning of glaciation cycles over the last half million years. The probability that the correlation is unimportant and coincidental is 0.00013%. Some of the current scientific paradigms, such as the cause of ice ages, the Global Warming dogmas, but also the dating methods of ancient structures, are based on incorrect evidence. Ancient cultures oriented their pyramids and temples to other geographic poles. Our astounding and significant discovery is that Homo sapiens’ architectural history goes back more than 350,000 years. There is no place to hide from or cover up our conclusions. | © Mario Buildreps 2015-2019. 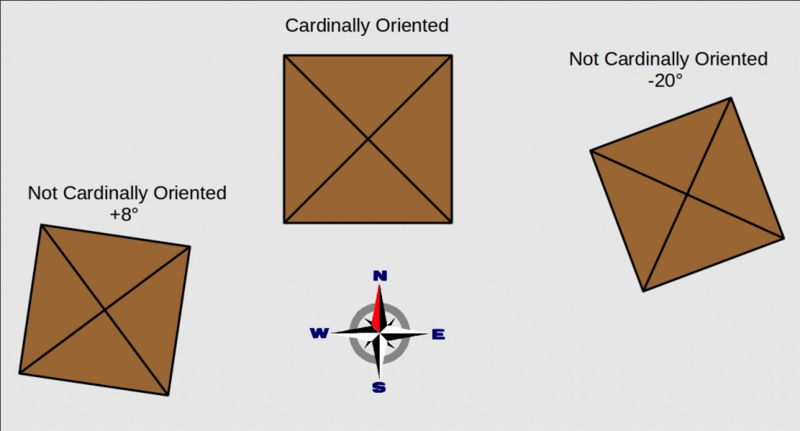 The orientation of a building is purely mathematical because orientation is dimensionless, i.e., not physical. While the size, weight, or chemical composition of a structure might change, its orientation is, by definition, independent of material properties. Many astronomical, religious, and even political buildings, like the pyramids of Giza, the Yerkes Observatory, the White House, the Taj Mahal, Angkor Wat, and the Vatican, are cardinally oriented. Their architects oriented them to our current cardinal system, and that means to our existing geographic pole. When we process the orientations of virtually all ancient buildings around the world, it reveals a great discovery. Our research is so new, so innovating and refreshingly novel that you will not find anything like this anywhere else, except maybe some copies of this original material on other websites. One giant ice cap once covered the Northern hemisphere. In this animation, we show two crustal spin positions of the Earth. The location of this ice cap was non-symmetric relative to our current pole position. 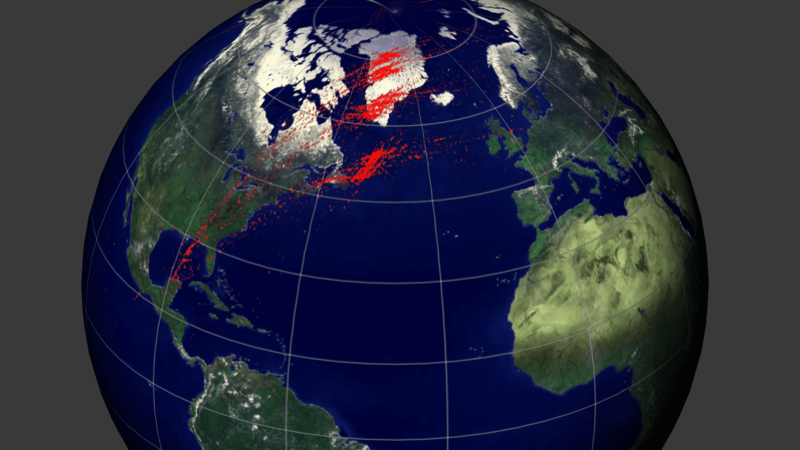 On the left is the current spin axis and on the right is the spin axis on Greenland. Which one looks more logical if you look carefully? Why was Russia not entirely covered? That is because we have discovered that the spin axis was on Greenland, at the center point of the massive, former glaciers. We have confirmed with data analysis of ancient structures that massive deformation cycles over the last 500,000 years reshaped the landscape radically. The spin axis has migrated five times over the last 500,000 years. An event that science has called “glaciation cycles.” Our research has profound consequences for many of the scientific dogmas. The Greenland ice sheet is the last remnant of a series of crustal deformations. That is the reason why it is still there and why it melts very slowly. Some people are shocked by the vast array of facts that supports this new mathematical model. They deny that there is any evidence for this to be true and go on with their lives. However, who dares to deny established mathematical facts? The facts of our new dating model are not only supported by our mathematical proof, but also by flood myths and stories of “Visitors from the Sky.” As if that is not enough our conclusion is furthermore supported by scientific observations such as the orientation of ancient sites, paleomagnetic data, orbital data of the Earth, and ice core data. All data is pointing in only one compelling direction. There is no escape; there is no place to hide from this conclusion. Most people are even more shocked when they discover which time frames we have mathematically proven in our theory. While we have all been conditioned to think in terms of a few thousand years, here we are considering a time frame of human history of more than 350,000 years. The pyramids of Giza belong to the youngest ancient structures on this planet. They are the crowning achievement of very advanced civilizations that once spanned the entire planet. Our method explores the orientation of pyramids and temples spread all around the world and combines them in a database. 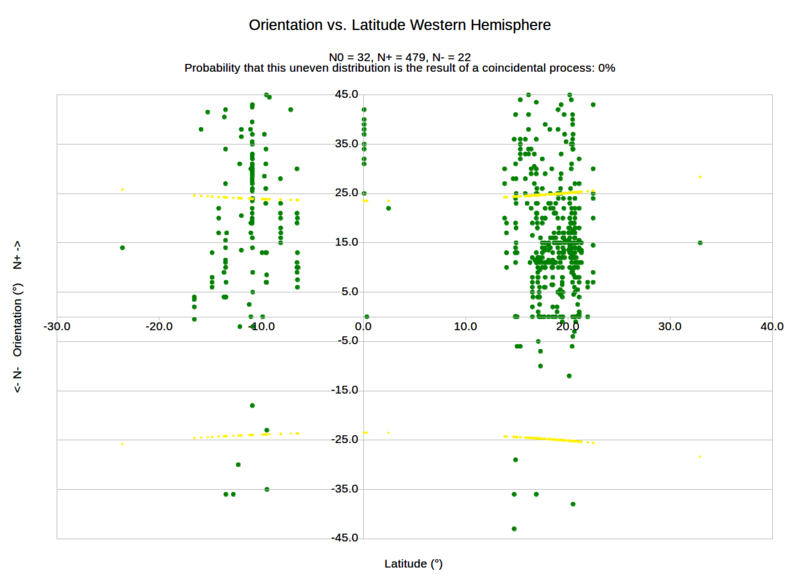 What we have discovered is that their orientation extensions result in one significant mathematical geodetic pattern. The resulting pattern appears to form several nodes. 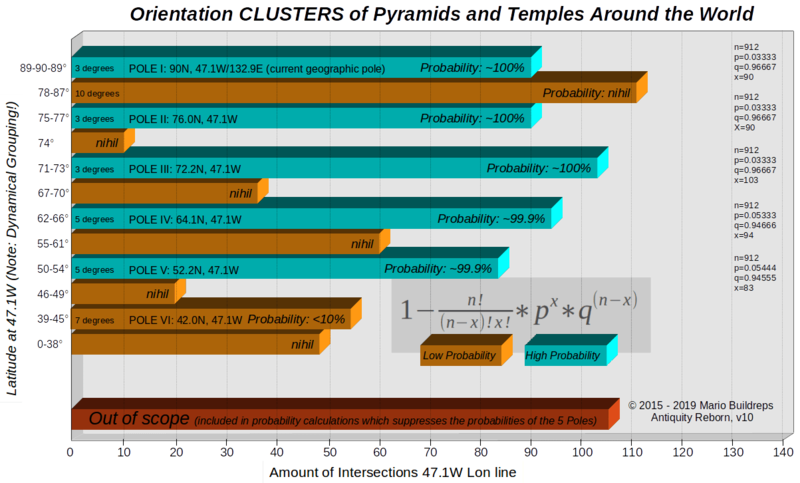 The probability that nodes of considerable size, resulting from the hundreds of intersecting orientation extensions, can occur randomly has been calculated and is close to zero for each intersection node. Because the nodes occur in a latitudinal direction, they point to drastic climate changes, and we suggest that these are due to a series of crustal deformations. Remarkably, in every instance, we see that the distances between nodes correlate with the temperature peaks and valleys of the last series of ice ages. 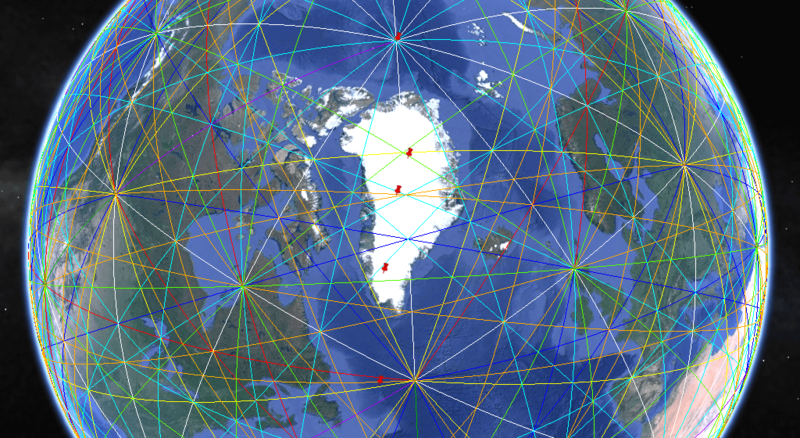 Moreover, of all possible places on our planet where these nodes could show up, they occur massively around Greenland. The odds for this concentrated nodal pattern to follow coincidentally the same sequence as the substantial temperature changes over the last series of ice ages is 1 to 256. We are talking about a time frame of 350,000 years. However, when we examine these patterns more closely, we find an even rarer chance of 1 to 750,000 for the latitudinal pattern of nodes and temperature changes to fit coincidentally onto each other in this specific region. It appears to be improbable to be coincidental altogether. To the contrary, it is not some statistical glitch but a very potent mathematical “signal” from more than 900 independent ancient structures around the world. We have discovered an ancient phenomenon that traditional science has completely overlooked, comparable to an encrypted message from outer space. It is time to wake up! Fig 2: Ancient pyramids are spread all over the world. Lost civilizations built all together thousands of them on every continent. The orientations of more than 900 ancient structures were mass-processed into a mathematical pattern. Our mathematical powerhouse revealed the unbelievable antiquity of Lost Civilizations and the truth of our long forgotten ancient past. This conclusion is consistent with excavation/depth patterns, i.e., when archaeologists dig up ancient remains from many meters of soil. The chronostratigraphy records tell that these layers are hundreds of thousands of years old. Geology and archaeology are separate disciplines both seemingly living in a fantasy world of their own. | © Mario Buildreps 2015-2019. Of all possible places, why are these nodes running over Greenland, the large island which has a vast ice sheet of unknown origin? Moreover, if that is not enough, why do the distances between the nodes correlate with the glaciation graphs shown below? Could that all be just coincidence? It does not appear to be so. The probability that this is all the product of a random coincidental process is 0,000133%. It is the most profound proof for the existence of former, ancient geographic poles, revealing the actual age of ancient structures. Our method delivers proof of corresponding latitudinal crustal displacements. The growing size of these clusters shows how the crust deformed in the past due to the displacements. The older the clusters, the larger is the extent of the deformations. Isn’t that logical? Our theory also explains simple and elegantly why and how the vast, thick ice sheet on Greenland grew. Due to deformation cycles of the crust moved Greenland over the spin axis. Greenland’s ice sheet is now the last remnant of the vast glaciers that once covered North America, North Europe, and partially Northern Russia. Is it not obvious now that this ice sheet will melt, and why it will melt? Greenland’s location is at a latitude that is not sufficiently cold to make the ice sheet to grow further. It is not cold enough to sustain the vast ice sheet in the long term, i.e., it will melt very slowly. It is now also easy to understand why CO2 lags on changing temperatures and why it cannot be held responsible for substantial climatic changes. We can now solve the many yet unsolved problems. What many climate scientists never seem to have noticed is that Greenland is also the center point of the Laurentide ice sheet, the Innuition ice sheet, and the Scandinavian ice sheet. As a climate scientist, to “create” an icecap on Greenland by playing with computer models with the assumption this island has never been on the geographic pole requires the strangest, most unscientific models you can imagine. Climate science has nothing to do with real science – it is a pseudoscience that mostly serves the agendas of politicians. Mainstream scientists do not dare to oppose this agenda and are afraid to lose their funding. Our discovery questions a host of mainstream ideas regarding history, paleontology, archaeology, climatology, and geology. Mathematics, as the Queen of Science, does not care about ideas built on material “evidence.” Mathematics is the only immutable truth wherever we are, whatever we do, whatever we believe, and no matter how much mathematics is hated or feared. Mathematics can show us that most generally accepted ideas, from history to geology, are based on corrupted science, i.e., wrong belief systems. Fig 3: This simulation shows a correlation between ancient pyramids and temples spread all over the world. Billions of complex calculations revealed this point cloud that we have projected over a sphere. The clustering around Greenland is visible. Greenland was once on the North pole, and that is the reason it has an ice cap. That is also the reason why it is now melting. This powerful mathematical discovery or “signal” shows how deep this pure and profound theory goes, veritable light years beyond the current materialistic paradigm. 40.6% of the ancient sites appear to be related to ancient geographic poles. Their typical orientation patterns join together in an area of only 2% in such a way that they follow the rhythm of the ice ages. The odds for this pattern to be the product of coincidence is unimaginably small. | © Mario Buildreps 2015-2019. It is also crucial to realize that not all ancient buildings were oriented to an ancient geographical pole. We found that more than 37.3% of ancient buildings do not align with one of the nodes. Isn’t that entirely normal? After all, we do not live in a perfect world. Not all ancient architects oriented their structures to the cardinal directions, but the majority chose to do so, and thus they left an indelible and essential message for us. We proved with our new dating method that the crust had crept exclusively in the latitudinal direction over extended periods when the Earth was in high eccentric orbit around the Sun. Antarctica, strangely enough, did not move and remained at a relatively stable position. The graph of Earth’s eccentric orbit around the Sun fits perfectly over the glaciation graph (Fig 12). Science still has no clue why this is so. The large rotational variations (and tidal oscillation) of the Earth during high eccentric orbits (as is the case with our Moon) generated a “vertical” reaction force. This force, when large enough, caused a large part of the crust to crawl and deform in the latitudinal direction over extended periods. Our rationality has profound consequences on our grasp of ancient history. Humanity, as well as the ancient sites, are much more ancient than we ever imagined. Imagine that someone decides to build a home on the heath, in the middle of nowhere. The new home is going to be square or rectangular. What will make this person decide the orientation of this house? The Cardinals? To the Rising Sun? To the ruling wind directions? The local geography? Alternatively, something else maybe? What could this “something else” possibly be? That is maybe not entirely relevant for an ordinary home but how would an architect orient an astronomical observatory? That is when such a question would become relevant. Most observatories’ orientations are to the cardinal directions. It is easy to understand why. How else could one “rule” the sky? If we look at how many cities in the US are oriented built from scratch in the middle of nowhere, we see they are most of the time cardinally oriented. Any other orientation is a sort of gamble game. An almost chaotic process of stowing buildings as effectively as possible in the remaining space. Many architects will align their project according to the Cardinals when they have enough space to do so – and some do not. There are as many reasons as there are architects, ranging from spatial planning to natural environmental factors like mountains or rivers. That is how this simple (although mathematically complex) method works – it can reveal some deeply hidden aspects of very ancient civilizations. Most people believe that no advanced structure-building humanoids existed when Earth was in the middle of a series of ice ages spanning the past hundreds of thousands of years. How do we know that is true? Because there is no “evidence”? We want proof, not vague signs of evidence. Let us be clear about the nature of evidence. Have we ever seen evidence that was not overthrown by other, newer pieces of evidence? When dimensions and measurements such as kilos, Newtons, meters, seconds, Joules, and so on are involved in the primary evidence, it is likely that this will be overthrown one day by other “standards” serving as evidence. Homo sapiens is present on this planet for more than 400,000 years and has been a gifted builder directly from the start. It is the species that decides its capacities and not the conditioning institutes that we call “educational training”. What is orientation? It is dimensionless, hence purely mathematical, and not materialistic. For example, 90° = ½π and 180° = π, and so on. With the location it is likewise; namely, we have degrees or Pi solely – and this means that there are no materialistic units attached to it. By defining ancient buildings like this, the ancient builders show us a way to an ultimate and undiscovered truth: our real history. Once you have entirely grasped this concept, a whole new world will unfold to you! Fig 4: A square or rectangular building like a pyramid has four sides. We can define the orientation of such a structure uniquely, so as not to discriminate one flank over another. The only unambiguous way is 45 degrees clockwise or 45 degrees counterclockwise. As you will see, orientation reveals a mighty mathematical way to describe the relationship of ancient structures concerning Earth’s shifting crust and the rise and fall of glaciation cycles, and ultimately of long-forgotten civilizations. | © Mario Buildreps 2015-2019. Fig 5: The intersection points of the orientation of these two structures, both facing North (cardinally oriented), is on the current geographic North pole. They belong to the same contemporary time frame. We have performed massive data research to more than 900 of these ancient monuments and what we have found has stunned even the most seasoned skeptics. | © Mario Buildreps 2015-2019. We are now able to prove the age of pyramids and other such structures solely by their orientation, without digging into the ground or putting even one step on a monument. That is the difference between materialistic sensory-based science and mathematics. How is this research done? By mass-processing the orientation and location of ancient buildings, we were able to determine the rough time frames in which specific structures are built. The correlation between orientation and age has profound importance, as you will see. In this area of research, one decade of satellite footage has been more constructive than centuries of digging. Although it might be necessary for other scientific disciplines to dig up the foundations from under thick layers of soil, for our purposes, examining satellite footage is better than mindless digging. When we want to find the geodetic intersection point of the orientation of two randomly-picked structures that are non-cardinally oriented, there is a significant chance that this intersection point will not reveal anything meaningful. That is because their intersection point can be located anywhere on the globe. Such an endeavor is probably not likely to result in anything fruitful. For example, it is easy to verify that the intersection points of the pyramids of Giza and the tomb of Ping of Han in China intersect each other on the current geographical North pole (fig. 5). We know what this means; they were intended to be oriented in this way. But what about the 85% of non-cardinally oriented structures? Can we do the same with two structures that are oriented with a seemingly arbitrary angle? For example: can we do that with Teotihuacan and the Great Ziggurat of Ur? The intersection points of these two are 35.050N, 93.675W. What could we possibly find here? Nothing of importance as far as we can tell because there is no way even to suspect that connecting these two different structures via their intersecting lines could have something in common. Or perhaps, more importantly, we have no idea why they were “uncardinally” oriented in the first place. No archaeologist can tell you why Teotihuacan or the Great Ziggurat of Ur are oriented in their unique way. Intersecting lines are neutral, so to speak – they represent a purely mathematical entity and have no meaning until they are correlated to each other by processing many hundreds of additional intersecting lines from other structures and then tabulating the resulting data. Fig 6: This picture shows in one view how the intersection line runs from pole to pole along a rough reference line of 47.1W. The intersection point from the two different hemispheres is at 73.2N, 47.1W. Because we now have two points, we can draw a connecting line. This line runs from the current North pole through the location of a previous pole. The point cloud of Fig 3 played an important role to verify this outcome. | © Mario Buildreps 2015-2019. Some people wonder how the North pole could have migrated so seemingly perfect in the latitudinal direction along the reference line of 47.1W. It did not shift immitigable along this line. It moved in an irregular pattern along a rough latitudinal path in hundreds of thousands of years. The crust deformed in this typical way because it obeys Newton’s 2nd Law of Motion, exemplified by a spinning top reacting perpendicularly (at right angles) to its causative force. The cause is the Sun’s oscillating “pull” during high eccentric orbits. That is why the glaciation patterns and eccentricity (part of Milankovitch’s cycles) correlate perfectly with each other. As stated, the crust did not shift equally. It was heavily deformed while Antarctica hardly moved. During this complicated deformation of earth’s skin, the North pole migrated in the latitudinal direction. Shown below in Fig 14, you will find illustrations indicating the Poles I to VI with red dots. The size of the red dot grows with the age of each pole. The path of the pole is defined by the dimensions of the red dots, so that is not entirely a straight line, but roughly in the latitudinal direction. The reasons for the red dots to become larger is because of the growing uncertainties of defining a pole within a specific diameter, i.e., the crust was invariably deformed due to the crustal displacements. Fig 7: This unique graph shows how ancient structures are oriented on the Western Hemisphere. They are massively positively oriented, i.e. pointing in a direction that is greater than 0 degrees (current North). 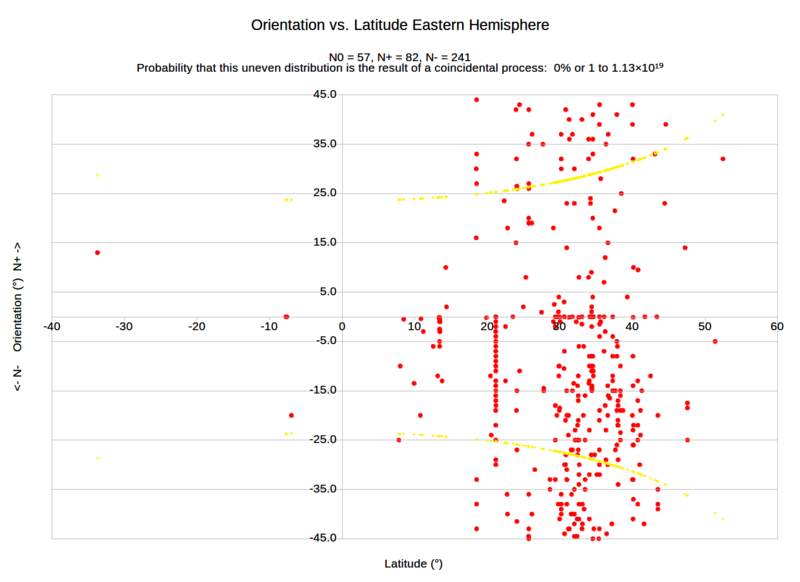 There is no correlation between latitude and orientation, hence we debunk the possible claim that they were “solstice”-oriented buildings. The yellow marks show the relation between solstices and latitudes. There is no correlation between contemporary solstices and orientation. The amount of ancient buildings that are positively oriented is about 16 times as high as those that are negatively oriented. The odds for this uneven distribution to be coincidental is zero or 1 to ∞. That is why we are 100% sure that this orientation depends on something that has never been discovered before – a moving geographic pole from the perspective of the crust (a moving magnetic pole leaves a completely different signature). | © Mario Buildreps 2015-2019. Fig 8: This graph shows how ancient buildings on the Eastern hemisphere are oriented. They are massively negatively oriented, i.e. pointing in a direction that is less than 360 degrees of the current North. The larger spread is caused by the much larger area (from Europe to China) in which we find the ancient buildings. The amount of ancient buildings which are negatively oriented is more than three times as high as those that are positively oriented. The odds for this uneven distribution to be the process of coincidence is close to 0%. The yellow dots marks the solstice angles for each latitude. There is also here no correlation between solstices and orientation. | © Mario Buildreps 2015-2019. The probability that many structures, randomly spread around the world, are oriented like this is so small that it surely is not coincidental. That is why we are 100% sure that ancient monuments were oriented to one feature that is common wherever we are on Earth: a geographic pole. But the position of this geographic pole has changed over time. The only correct conclusion is that the crust has been deformed significantly over the last 400,000 years, without geology even noticing this fact. They measured it, yes, but did not interpret it as a movement of the crust. They explained it as “glaciation cycles.” Logical maybe, when you believe the crust was rigid over the last hundreds of thousands of years. Strangely, geologists believe in the movement of the “invisible” magnetic field. It seems more convenient to think that an invisible mass that is much greater than the crust can change directions as sudden as the weather. But it is ironic that even paleomagnetism points to movements of the crust. Until now, this discipline has been attempting to repair errors and contradictions in the conventional data but without much progress. However, when we incorporate the movements of the crust in their data, the errors suddenly become much smaller, and that adds to the mountain of proof we already have. We have proof from different angles, and all of them are pointing to the same unbelievable truth. Not only were the biblical cataclysms very real, but it is also indisputable that in the distant past the ancient architects oriented their structures to a very different geographical pole. Our proof goes many ways – deep down into the rabbit hole. We are also sure that structure building humanoids, the Homo predecessor, came originally from South America, from the region of Brazil and Peru, around 800,000 years ago, and then spread Northward. We have concluded this from the orientation patterns. We studied the orientation patterns in relation to crustal shift patterns and the most probable migration routes our ancestors took. The trends go North through Mexico, spreads over the US, and then go over a land bridge across the Bering Strait into Russia, Japan, China, and the Middle East. Land bridges were everywhere across the world at that time when the ice sheets were developing on the Northern hemisphere, causing the sea levels to be significantly lower than today. The orientation patterns we have found in the region of Iraq, Iran, and Syria correlate with the periods mentioned in the Sumerian tablets, around 420,000 years ago. The details of what exactly happened are of course impossible to reconstruct, but indicators are pointing to a significant event in the “mutation” of Humanoid species. Fig 9: DNA patterns of the Homo erectus family tree show correlations with orientation patterns. The “Out of Africa” hypothesis is short-sighted and based on incomplete and outdated evidence. Why did the Neanderthals, a tough, highly intelligent, and well-adapted species, become extinct? Ask yourself this simple question: If Göbleke Tepe is only 12,000 years old and is allegedly the oldest human-made monument on Earth, what were Homo sapiens then doing the rest of the time? Was Homo sapiens wandering around for over 400,000 years doing nothing and leaving no traces of significance? We have found compelling proof that Homo sapiens was very active over the last 450,000 years. There is something very wrong with the dating methods of the established academia. What would be the purpose of maintaining and teaching a false paradigm? source: Nature.com | © Mario Buildreps 2015-2019. Maybe you suspect that, if we do the same kind of research regarding the orientation of contemporary buildings, we could, for some odd reason, find a collective orientation that differs from North similar to the ancient buildings. But that does not appear to be the case. The joint orientation of contemporary buildings points almost precisely towards our current geographic pole, our current cardinal system. The more data one gathers – whether in a particular region, one country, one continent, or the whole world – the more obvious it becomes that contemporary buildings have an average collective orientation toward the geographical pole. No modern culture seems to prefer a specific direction other than a cardinal orientation. This large-scale investigation is part of our challenge to prove that ancient buildings differ largely in orientation and that this deviation has a reason: the geographic pole was at another location back then, a very long time ago. Our mathematical model completely contradicts what contemporary history books are telling us. History is about storytelling and has nothing to do with reality. We built a random location generator for every continent and generated a list of 392 contemporary buildings with their location and their respective orientation. When we compiled their collective orientation, they all pointed to our current geo pole within ±0.5°. This result proves that, when we add up the orientation of large numbers of independent buildings, they will always point to their geographic pole. 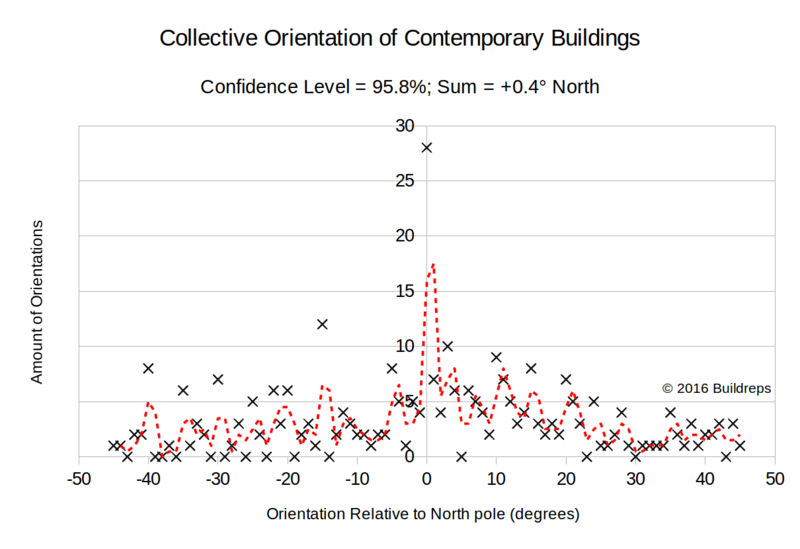 Fig 10: The collective of the orientations of 392 contemporary buildings points almost exactly to our current geographic pole. The significant deviation alone between modern buildings and ancient buildings proves mathematically that old buildings were oriented to another geographical pole location. Never before, has anyone ever done this kind of research, in this manner and on this scale. | © Mario Buildreps 2015-2019. What is the Time Frame for These Ancient Poles? The interpretation of this whole new view on ancient times is that, when the crust shifts (along with its pole) in the latitudinal direction, it causes a new glaciation cycle. Most researchers, even the most controversial ones, keep sticking to a time frame of a few thousand years. They have never dared to even think in terms of hundreds of thousands of years. That is why the many ancient structures, as well as all the old myths, remain shrouded in mystery. Our new dating method sheds an entirely different light on our history and provides an opportunity to explain most of the mysteries that no one has ever solved before. There are just too many dating mysteries around the world that scholars like to compress into less than 10,000 years, which is, according to our intense research, completely irrational. The amount of labor necessary to build all these tens of thousands of structures in a few thousand years was not present. That is another indicator that the official timelines are incorrect. We consider a time frame of over 400,000 years without a shadow of a doubt. Our conclusions are fully backed up by large amounts of data and mathematics. Why do we find hundreds of pyramids all around the planet? Why do we find thousands of dolmens all around the planet? What about Puma Punku, Sacsayhuaman, Teotihuacan, Göbekli Tepe? There are thousands of these ancient monuments, all over the world. What about the Nazca lines? Have we ever unanimously solved how the pyramids of Giza were built, not to talk about when and why? And if you think that you have answered one of these enigmas, stop cheering, because you have only solved a tiny fraction of the whole mystery. Have you ever heard of the mysterious Kailasa temple? If you have solved Giza, try to explain this one. What about Baalbek, Mount Shoria (Russia), Stonehenge, Carnac, Easter Island, and Yonaguni? How did they produce, move, and position megaliths weighing some 1000 metric tons? With the power of the mind, or with brute technology? If either of them is true, how? What about the underground city of Derinkuyu in Turkey? How and why was that built? And that list is just one grain of sand in a whole mountain of sand. Keep that in mind! To prove the correct timeline of any one of these mysteries requires more than only educated guesses and vague hypotheses. To even begin to solve these ancient enigmas requires more than hopping from one idea to the next. It requires a deep understanding of mathematics and immutable truths. With our new dating method, we have developed sufficient mathematical proof to support the claim for our enormously stretched timeline. The Mayan, Aztec, and Inca cultures are much older than scholars always told us. Why did these cultures suddenly disappear? Scholars have never found a credible explanation for the rapid disappearance of these highly developed cultures, except mythos tales, opinions, and just ideas. For example: When scholars claim that a specific civilization abandoned a city in the 9th century AD, they are talking about the people who used the cities, not about the people who built the cities. There is quite a difference. Because they oriented their monuments to a different older North pole, the cultures who built them must also have experienced destructive crustal shifts, throwing them back into the “stone age.” It would be challenging to survive such a catastrophe. It appears that especially these Mayan, Aztec, and Inca root cultures are amazingly older than was always assumed. According to our research, the oldest traces go back to over 700,000 years! These cultures are the root of human civilization as we know it. The Out-of-Africa theory appears to be highly incorrect. Fig 12: The intersection clusters that we found at the beginning of 2016 showed a very tight correspondence with the temperature swings of the last glaciation cycles. The degree of temperature change corresponds one on one with the amount of shift from XS to XL. The odds for these patterns to fit coincidentally is only 1 to 3,125 (note: that includes the yet unproven Pole VI). It is not difficult to see that very high eccentricity caused two consecutive shifts (B and C). It is easy to see how well eccentricity (part of Milankovitch’s cycles) and ice ages correlate with each other. There is only 0.03% chance that this correlation is unimportant. Note that science has never done anything with this simple, obvious observation. Our search for much more data on ancient structures has progressed a long way since 2016. | © Mario Buildreps 2015-2019. The classical view: During a glaciation, the geo pole was where it currently is, so the crust endured no shifts or deformations, but the temperature changed nevertheless. Which mechanism caused this glaciation is still unexplained. Geologists who believe that the Milankovitch cycles were the cause of the ice ages are parroting unexamined beliefs. We have never seen any calculations that prove this assumption even to be correct. Earth is a sphere, and will always receive the same amount of solar energy, no matter how the sphere rotates towards the Sun. The climate will show ripples of about ±1.4°C, but these changes are caused by varying Solar activity. Our new view: Crustal deformation causes a glaciation cycle. Collected ice core data shows that the amount of crustal shift corresponds to the temperature change of the glaciation cycle. The crustal shift moved the cold North pole region to a warmer area and a more temperate zone to the polar region. When geologists examine the phenomenon with the assumption that the crust is rigid, they interpret their findings as a global cooling down, which never happened. The temperatures return to “normal” after a period of tens of thousands of years. A balance is again restored. This crustal “crawling” process was caused by a highly eccentric orbit of the Earth around the Sun, resulting in oscillating gravity tearing the crust slowly apart. That is why the patterns of eccentricity and glaciation match together. Crustal deformations proceed very slowly – between 15 to 35 meters average per year, depending on the rate of eccentricity. The crawling process continues over periods spanning tens of thousands of years but has a definite start and stop values. Paleomagnetic records show correlations with the crawling crust. Other evidence is indisputable: high dust concentrations in the atmosphere during the crawling process due to very heavy volcano eruptions. The geological patterns are distinct, and the mathematical proof from the orientations of ancient sites removes all doubts. Humanity fell back into a new Stone Age for a very long time. When the crust deforms, and the North pole migrates, the temperature changes in that specific “ice age” clearly correspond with the temperature differences at the latitudes of pole locations in different time frames. Our methodology permits the dating of ancient cultures (pyramid builders of yore) in a more reliable manner, via the orientations of their monuments, which in turn is related to a glaciation cycle. Every glaciation cycle stands for an era. However, some structures do not match up with one of the former poles. Dating these structures requires a thorough investigation by using the path of the pole since it is possible these structures date from periods of crustal unrest. Many structures have been dated by us, as you can see summarized below. Geologists say that every ice age is a period of an alleged cooling down. “Alleged” because the classical view dictates that the crust is rigid and cannot deform significantly over, geologically speaking, short periods. Polar ice sheets that shifted to warmer regions will cool that region, and the ice sheets will start to melt very slowly. Melting takes place throughout many thousands of years. The more moderate region that shifted to the pole now becomes cold as well. The melting energy must be provided by the two Gulf Streams that transport the heat from the equator to the icecaps (following the 2nd Law of Thermodynamics). That is why there is a warm Gulf Stream and a North Atlantic Drift running close to Greenland; they are necessary to restore energy balance. True to the tenets of Occam’s Razor, our new methodology provides an easy-to-understand explanation for glaciation, ancient history, and crustal geology – in the simplest possible way and with the fewest assumptions. Fig 13: The analysis of our full data set delivered spectacular results. The probability percentages are almost 100%. We can also see, that the latitudes/temperature variations correspond closely with the large fluctuations of the glaciation cycles over the last 450,000 years. The odds for the distributions of Orientation Clusters to fit so seamlessly on the glaciation graphs (Fig 12) is 1 to 750,000. | © Mario Buildreps 2015-2019. Fig 14: Four former poles are mathematically proven, but the oldest known former pole (Pole VI at around 42N) needs more confirmation. This oldest and yet unproven pole is mainly substantiated by Sumerian and Peruvian sites. The amounts of shift A through E correlate with the temperature changes of the last series of ice ages. | © Mario Buildreps 2015-2019. Why did the Crust Shift in this Direction? The most probable path of the pole is in the southerly latitudinal direction. It follows the basic principles of physics and is like the reaction of a spinning top on an external force; it reacts at 90 degrees to the direction of its rotation, and that is why the crust shifted as we propose in our hypothesis. As we show in Fig 12, follow the highs and lows precisely the same rhythm as the distances between the Poles I to V. The probability that two independent relatively simple patterns match is quite small: 1 to 256. The likelihood that we look at a coincidental match is less than 0.4%. But if we incorporate the natural temperature variations due to different sun activity (Fig 16), we see that the patterns match even more accurately. And for these much more complex patterns to match coincidentally is very small: 1 to 750,000. Thus we have found the most probable cause for ice ages. These were not precipitated by changes in CO2 levels but by crustal deformation cycles. CO2 is just a proxy that lags on the crustal deformation cycles. Fig 15: This animation shows how the crustal displacements relate to the glaciation graphs. The relation between the size and extent of the shifts and the large temperature swings to be just coincidental is 1 to 256 or 0.39%. When we further zoom in on the variables of natural temperature changes and crustal deformation temperature changes we find a probability of 1 to 750,000 for this to match so perfectly within a certain margin of error. This almost perfect match in a complex of systems is the mathematical proof of multiple crustal shifts in the ancient past. Note that the time between the stable poles, the duration of crustal deformations, stretches out over tens of thousands of years. The deformation process proceeds very slowly. | © Mario Buildreps 2015-2019. Fig 15: This graph shows us with a very high degree of certainty which timeframe we are dealing with regarding crustal shifts. 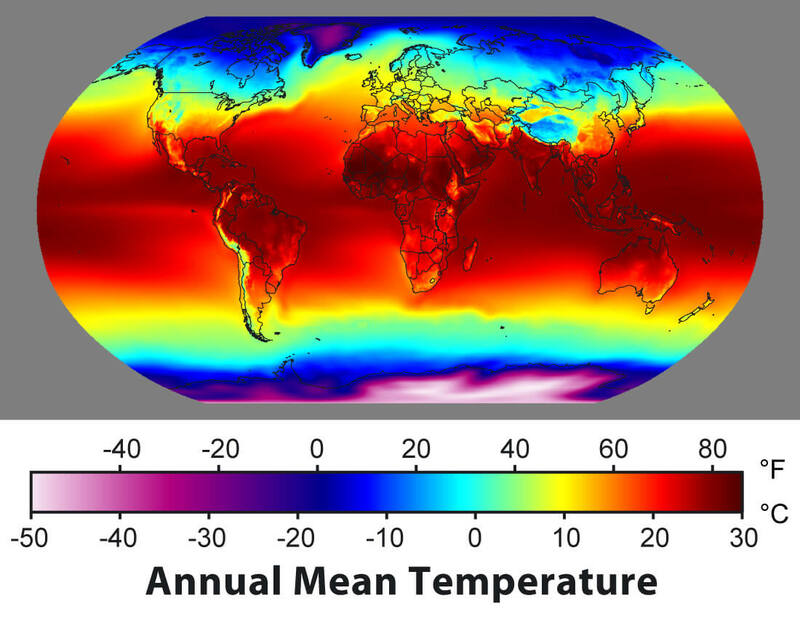 The natural temperature swings of Earth’s temperature (green areas) have to be filtered out to find the magnitude of the consecutive crustal shifts. Note that the amount of natural temperature variation varies by 2.8° Celsius (±1.4°). Varying Sun activity is the most likely cause of this discrepancy. The odds for this correlation to be coincidental is 1 to 750,000. Although there is still much research to be done, we have found profound mathematical proof for the most likely timeframe for the deformation processes of the crust. What we furthermore witness is that Pole III seems to be slightly incorrectly positioned. We suspect this because of the shift errors from IV to III and from III to II cancel each other almost out, and the chance for that to be just coincidence is small. But because our method depends strongly on ancient structures, we have currently no means to correct this. Of course, we could position Pole III slightly more Northerly at around 72.5°N or 72.6°N to compensate this glitch, but that would undermine our method. The cause of this relatively large deviation is possibly due to very large deformations of the crust particularly in the region of the majority of the structures. | © Mario Buildreps 2015-2019. Important to note is that the average temperature gradient of 0.576°C per degree latitude that you find in Fig 15 is calculated based on the surface area to which the specific temperature belongs. For example, at the poles, it is very cold, but the surface areas of the poles are tiny compared to that of the equator. Hence, the poles are not significantly contributing to the so-called ΔT, the temperature differences. 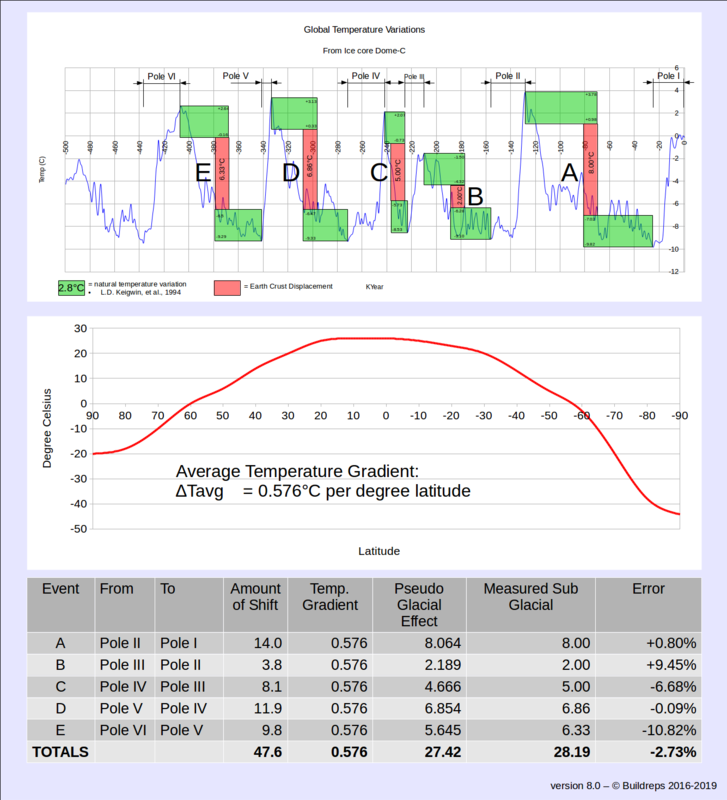 The reason why these temperature gradients are used this way in our research is that the temperature reconstructions from the ice cores use a similar method. Here we transform the data from the ice cores, and we recalculate them into a latitudinal deformation of the crust. When we subtract the natural temperature variations, 2.8°C, from the most significant peaks and valleys in the ice age graphs, we find the remaining crustal deformations of the last significant events. In all cases, they are matching with temperature gradients between two adjacent subsequent poles. The chance for such a match to occur coincidentally in such a complicated set of patterns is 1 to 750,000. We are sure we have found the correct time frame. We have processed a large amount of data to calculate and prove the position of the former poles, and to calculate the reliability of this new theory. It is crucial to realize that Antarctica hardly moved its position at the South pole, while Greenland raced over the North pole. When we look at the Pacific, we are looking at an almost uninterrupted plate that was stretched due to the deformations. That is the reason why there is no longer a continent in the Pacific. Australia was ripped off from Antarctica. Zealandia became submerged in the massive stretch movement. When we look at the other side of the globe, it seems as if the opposite occurred. A massive compression took place from North to South, and a spreading from East to West. Hence a resulting movement of Greenland over the pole towards the equator. The timescale of these large deformations is much shorter than geologists ever realized. Yes, there are tectonic forces and the tectonic plates move towards each other or away from each other. But there is another force present that geologists have never recognized. The Earth is much more dynamic than we ever thought. Our book (in progress) deals extensively with this subject because, although crucial, it is hard to grasp. The orientation of the foundations of ancient buildings, mainly because we processed them in large numbers, gave us profound insights into ancient times. 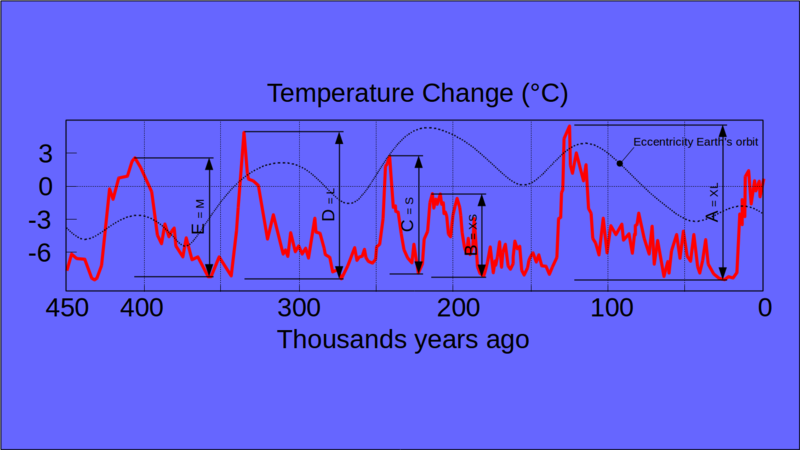 Ice age graphs correspond to the eccentricity of Earth’s orbit over the last 800,000 years. The chance for these two graphs to correspond to each other coincidentally is 0.00069% or 1 to 145,000. It shows that we must look at eccentricity for the root cause of ice ages and nowhere else. It is weird to notice that geology consequently overlooked this. Eccentricity causes variations in the rate of rotation of the minor object (in this case the Earth). The inner parts of the Earth are much denser than the crust. Hence they will react less intensely to tidal forces of the Sun. Tidal forces vary annually (in case of Earth). The more significant the eccentricity, the larger the tidal variations. At perihelion, the Sun “pulls” hardest on Earth, almost egg-shaping the Earth. At aphelion, the Sun “pulls” less on the Earth. At an eccentricity of between 0.03 and 0.05, these annual forces can vary up to about 26%, putting the Earth’s different layers under varying amounts of stress. From this we can quite easily understand what happens: a corresponding latitudinal reaction force is born. Compare it with a spinning top that reacts perpendicular to an external force applied to it. This reaction force drives the lightest and outer part of the Earth, the crust, to crawl perpendicularly to the sense of rotation during high eccentric orbital periods around the Sun. The data indicate with a very high degree of certainty that former poles, namely former poles II, III, and IV existed on Greenland during the most recent ice ages. The crust has continued to deform not just slightly; it moved significantly. The North pole moved 38 degrees of latitude over the last 330,000 years (from pole IV to the present pole) — the crust ticks like a clock on eccentricity. The whole crust in the region of Greenland was heavily deformed – leaving Antarctica surprisingly stable at its current position – and Greenland moved over the geographic North pole between 330,000 and 110,000 years ago in two shifts, meaning that Greenland has three former geo pole locations. To illustrate: This is like three fence posts having two spaces between posts. The Greenland ice sheet is a result of this era, and that is why it is so densely covered with ice and is melting now. Earth crust shifts do not happen overnight. They are slow, unstoppable processes that take place over extended periods. The most violent, swift crustal shifts took place throughout about 15,000 years, and the slowest ones happened throughout about 100,000 years. However, it is a period of constant turmoil, megaquakes, sloshing oceans, volcano eruptions, tsunamis, and a changing climate due to the shifting latitude and sliding earth crusts. Sea levels have changed repeatedly over many tens of thousands of years and will again fall or rise depending on the position of new geographic poles. Whether the pole is in the ocean or on land makes a world of difference in the formation of ice sheets. An Earth crust shift is not the spectacular event that many people think it is. It is a massive, slow, environmentally disruptive, mighty deformation process of the crust, which forced many of the ancient peoples to migrate to safer places. It also caused massive extinctions of the Human population which we now call “lost civilizations.” The reasons for these massive changes have been right under our noses, and we collectively fail to recognize them. The geographic North pole migrated in the latitudinal direction, while parts of the crust were massively deformed. Many traditions around the world describe these events as deluges and global catastrophes. Antarctica remained (almost) stable at its current position. Migration of the geographic North pole leaves proxy marks behind in the ice sheets of a stable and steady South pole. Both poles are equally sensitive to changes. That is the reason why the movements of the agile North pole are accurately registered in the ice layers of the stable South pole. The shifts of the North pole relate to “ice ages” in the exact order and magnitude as they are registered in the ice sheet of Antarctica. Ancient structures are oriented to these former geo North poles. The age of the ancient structures is in most cases as old as the pole. CO2 lags on temperature changes and is therefore not the (primary) cause of temperature changes. Our new mathematical crustal displacement hypothesis will eventually prevail and change the way science looks at our history. It will take many decades to come to persuade them to accept the truth of what happened with the Earth’s crust. It will also have a profound impact on the current climate models once the method is validated and recognized by the mainstream “gate-keepers” as real and valid. Of course, it will probably take many decades for this theory to mature. Much energy is being expended in the development of our theory, and we make rapid progress. Increasing numbers of knowledgeable scientists are surprised and amazed by our new dating theory – the genie is out of the bottle. One example of the many profound implications this theory has: how much chance is there that paleomagnetism, which is a highly technical and well-funded discipline, develops a correct and valid theory anytime soon? Not very much – but why is that? Because mainstream Geology stubbornly ignores and dismisses the possibility of a slow latitudinal crawling crust during high eccentric orbits of the Earth around the Sun. Crustal movements would also leave traces in the magnetizable sediments, and in fact, destroy the patterns that geologists hoped to obtain. That is why this discipline has never come to one overall acceptable view of the movements of the magnetic pole. There is no way to recognize from the samples alone what has moved: the core, the crust or both. Because of the magnetic core moves, it is therefore not the only variable that left traces. Our book, which is currently in the making under the working title “Antiquity Reborn,” will turn many generally accepted paradigms into dust; not by swinging words of accusation at anyone, but by using mathematics in a way most people will understand and accept as valid. Aside from all the proof necessary to show what happened in the distant past, our book will provide a framework to develop a new look at lost civilizations, and what happened to them. It will also help us understand who we are and what our roots are. It will solve many mysteries and unite many scientific disciplines while probably raising many new questions at the same time. Amazing! An eye opener! Just wondering whether the results remain the same with other map projections (Gall Peters, winkel tripel etc)? Or is it irrelevant to your method? Thank you for your comment, Fida. Our method is independent of the map projection, it uses True North (the spin axis) as the only reference. At some point Greenland had to become a warmer place. When the seafarer from Scandinavian found this “greenland” they named it because they found it was all green and easy to feed their animals and to grow plants. How would this fit in? You say that the south Pole is stable at Antarctica but haven’t it left Antarctica now? Hi Lasse, you confuse the magnetic pole with the geographic pole. The magnetic pole is indeed no longer on the Antarctic continent. The spins axis is still there. I understood that the stories of “Greenland” as being known to have been started by Erik the Red in a marketing effort to attract settlers. That might be. But the tales in greenland tell us about the time when it was really a green island. I’ve been wondering about the dolmens. I have a hunch that they may have been emergency survival shelters to shelter from hostile sun rays, or possibly hail stones. Open sided to shelter a herder and flock or people. Is there a commonality of direction of the “open” side of the dolmens in relation to what would have been the orientation of the sun’s path? Are there more than one orientation of open-side? How much to build one in my back yard? Georgia guide stones lead me to believe that this is being kept a secret by a selection of modern population. Thank you so very much. Diamond sent me. Thank you for your comment, Russel. We can only speculate what purpose dolmens were used for. Our research to dolmens shows that little over 80% of the dolmens’ entrances were oriented to the south within a range of 90° (+45/-45). But they are oriented in such a way that their orientation correlates with the very ancient Pole VI, and that could mean they are between 410 and 440 ky old. In that case were their openings oriented to a very ancient sunset. It could be true they were used as very solid shelters for certain kinds of cataclysms. That could explain why such massive stones were used. The time period of Pole VI correlates with the stories as told in the Sumerian tablets, i.e., the Anunnaki coming to earth. Maybe were they used to shelter for all sorts of threats, but that is speculative. The dolmens are for charging your electrical body, such as chackras and meridians as explained in traditional Chinese medicine. I have studied this fenomina for over 20 years. As longer you are from the poles the bigger you have to build the dolman to get the same result. Those dolmans I don’t recommend to enter is those close to electrical wiring. So the dolmans are for healing your body. Mario – Super work. Crustal displacement would certainly lead to asymmetries in various natural records. The alignment of ancient structures is quite compelling, and it makes me wonder how asymmetries would be reflected in other data sets. Using diatoms as a proxy for global temperature assumes two things – their proliferation varies with temperature, and your favorite, the poles are fixed. But crustal displacement would leave a trail of asymmetric effects on diatom deposits too. Has anyone tried looking at the data starting with the assumption of crustal displacement to see if the data fits? Similarly, we should expect to see older and deeper ice deposits in places that have been closer to the poles for longer periods. And would we also expect the accumulation of ice in places like the Kolyma Mountains that have moved northward? Looking forward to the book! Thank you for your comment, Erich. That is indeed what we would expect to see in natural records like diatoms. As far as I know, there is no dataset available yet. The climate in Russia is changed dramatically over the last 130,000 alone. Before that time, between 350,000 and 130,000 (that is what we know for sure) was the climate of Russia moderate (Pole II, III, and IV) to even tropical (Pole V). Siberia and all the mountain ranges that surround Siberia have seen extreme climatic changes when the pole moved from V to I over the last 350,000 years. Kindest Regards and thank you so very much for putting your case forward on all the subjects you have thus far researched, and I wait with bated breath for your next fascinating journey into our past. Thank you for your comment, Steven. No, Randall Carlson nor Graham Hancock have contacted me to have a chat. Note that our work is one of the most controversial ones that is published over the last decennia. Some people are even scared of the idea. I don’t know if that counts for Randall or Graham. Our work might contradict their ideas or with the works that are already published in books and on video presentations. The Younger Dryas Hypothesis, for example, is a good example. If you read our views on this topic you will understand there is (in our view) not a single basis for the slightest correctness of this hypothesis. The ideas are in our view based on too little research. I don’t know how they feel about that. If anyone can debunk our philosophy, that is purely based on data, I would be glad to hear that. We (our small team) have no attachments to anyone and we are open-minded to all people. I am always open to contact. Very interesting site. Thanks for all the work! I was at Pumapunku last October and discovered that recent archeological excavations have now uncovered the original foundation which was covered by a 10-15 foot deep layer of mud. The good news is that most of the original foundation is still intact — it was ironically protected from looting by the same mud flow that destroyed the site. I have been in contact with the UC Berkeley archeologist who worked on this excavation. His name is Alexei Vranich. He posted a paper in which he gives the alignment of the Akapana (2 degrees 46 minutes east of north). However he did not publish the alignment for Pumapunku. Why not? My best guess is because the angle was totally anomalous. He couldn’t fit it into his theoretical understanding so he dropped it. Sound familiar? I asked him to share it with me — but so far have not heard back from him. 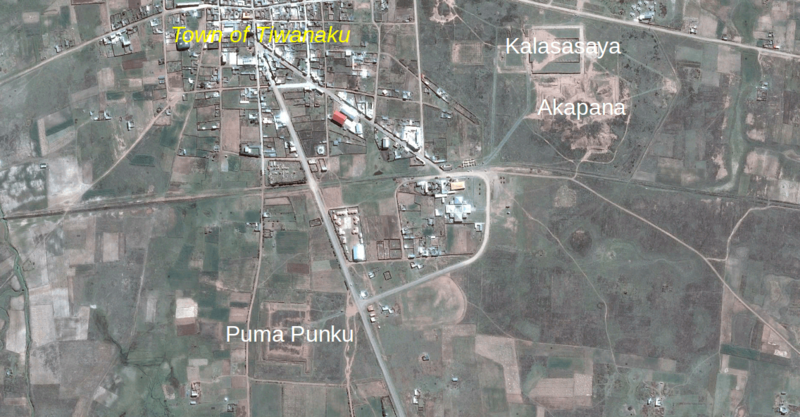 If you have determined the alignment of Pumapunku I’d be very appreciative if you’d share the data. I want to triangulate three sites (Teotihuacan, Pumapunku, and another site in Egypt, still to be determined. Maybe they will point to the old north pole…? I am impressed by your mathematical approach. However, I disagree with you on a couple of points. Hapgood originally thought like you that the crustal shift was very slow. However, later he became more open to the possibility of a sudden shift. As you know, he abandoned the theory that the ice buildup at the poles caused a centripetal shift toward the equator. Apparently when he crunched the numbers he found that the mass of ice is not nearly enough to shift the crust. On my recent trip to Peru/Bolivia I observed almost everywhere the old terracing built by the pre-Incas for food production. The terraces reach up at least 2,000 feet above lake Titicaca. According to one report the terracing extends to the snow line on Mt Illimani. They have not eroded away because there is little rain in the Altiplano. Today the terraces are not used — because they are much too high for food growing. This of course means that some event lifted up the Andes in a very short time frame. Darwin concluded – from his field work during the voyage of the Beagle — that the Andes had been raised up 8,000 feet. He was a uniformitarian and believed it had been gradual. But Darwin never made it up to the Altiplano. He never saw the terracing. I believe the sudden uplift was 2500-3000 feet at one fell swoop. But now I’m running on…enough. The lift and fall of landmass is one of the aspects that appears to have been left out so far. It seems to be quite feasible, but of course research has to prove this. Further understanding of this aspect is on my wish-list too. I have only one small question, that is a big BUT for me. There are numerous texts from ancient China and on the other side of the world where they speak of the sun standing still for several days and on the opposite side of the world where they write about several days of darkness. This can only mean that the earth stopped or slowed down its rotation. The mechanism for this must be something other than the Milankovitch cycles. If you accept the possibility of the truth in these stories, what would cause this to happen in your opinion? Thank you for your comment, Karen. There is a saying: the day that the world stood still. But why should we take that literally? Texts are often metaphors. Ancient texts often contain metaphors more than we are used to today. Another point is that a miraculous force that would make the earth stop spinning and then make it start to spin again or make it spinning in another direction would be immense and unknown. Magnetic activity is millions of times too weak to cause such an event, even if the magnetic field would increase immensely due to increased solar activity, micro novas or other sorts of outbursts. There are many speculators on the internet who mislead people, and also speculators with a sauce of scientific taste, but most are just speculating without sufficient data. I agree with you that the CME theory is, by its nature, a contentious one. The researchers who express it do not dispute Milankovitch cycles as the driver of the great ice ages. Of course the CME would have come at a time when the Milankovitch influence was already working to end the last period of glaciation nearly 13,000 years ago. According to the theory, it would have come while the northwestern part of the Northern Hemisphere was facing the Sun during Summertime. The tilt of the Earth would put Antarctica out of its path. A CME, basically being a small chunk of solar material of varying density throughout, would need to have a denser portion that struck a region most likely north of Washington, Oregon and Montana. It would create the same type of debris field that many researchers refer to as the YDB field and would be the reason for what is known in geology as the “black mat”. Further, their thinking goes that the force of the CME would have swept away part of the atmosphere existing over that area of North America which would have been replaced by a swift movement of the atmosphere mainly from Siberian regions. That rush of atmosphere providing an instantaneous drop in air pressure and temperature there which would explain the as yet unexplained flash frozen mammoths found there. It would also explain the masses of megafauna bones found in dense large quantities along a line in Siberia. Accordingly, Africa and Australia would have come out a lesser extinction impact on megafauna which is seen particularly in the remaining extent of large African mammals. I realize it sounds like a very spectacular event but there seems to be a continual mounting of evidence to support it. I believe that none of this would in any way be incompatible with your very compelling holistic approach in developing the theory of crustal displacements and the dating of civilizations and their architectural wonders around the world. 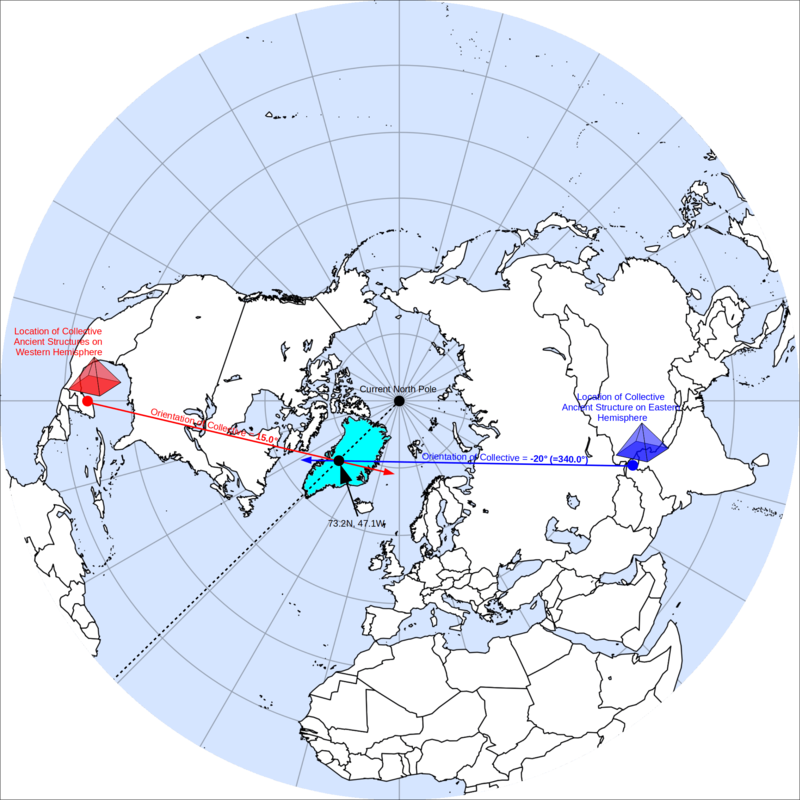 One question I would ask, how is it that the intersecting alignments at the 5 polar locations remain intact over the years if the crust is in motion as the rotational axis of the Earth is also changing? Would not just a rotational axis shift preserve such consistency over time? It seems that a moving crust would also shift the relative positions of the ancient sites and serve to create inconsistencies between their clustered alignments relative to the pole they were aligned toward. It might be helpful if you were to create a video showing how the crustal displacement proceeded in order that the alignments remain consistent. Thank you for your input, Howard. To answer your question shortly, the crust deforms around the core. The direction of the spin axis does not change other than already proposed by Milankovitch. And because the crust deforms around the core (that keeps spinning according to Milankovitch’s tilt and precession cycles) moves the spin axis to another position on the crust. A structure that is once built in a certain direction cannot be changed by itself unless there were deformations of the crust, and that appears to be the case. The orientation patterns of many structures follow a certain node forming pattern. The mathematical implications are also clear about another thing: the geographic North pole migrates, the geographic South pole hardly moves. Outstanding work and presentation Mario. Congratulations on putting this all together and sharing it. I would like to ask of your thoughts on the events of the Younger Dryas Boundary and the apparent abruptness of those events. Thank you for your comment and compliment, Howard. Our conclusion is that the Younger Dryas event was not unique. If you examine the number of temperature excursions over a period of 100,000 years instead of only some 15,000 years you discover there were more similar temperature excursions as that of the Younger Dryas. And because there were more similar excursions the likelihood that it was caused by a massive meteor impact suddenly drops to zero. That is something most researchers have never done. They don’t even seem to look beyond the first corner. That is a tragedy, especially because these people have chosen to “inform” less talented people about the “truth”. That is in our opinion a very large responsibility that some informers don’t seem to feel that way. Because the temperatures regarding the Younger Dryas event are registered ONLY in the Greenland ice sheet and not in the Antarctic ice sheet it was a local event. That is maybe one of the reasons that people have started to speculate about meteor impacts. That is tempting because they are so spectacular. The most probable cause for the Younger Dryas event and the many other similar events are changes of oceanic circulations. The North Atlantic Drift as we know it today has a massive impact on temperatures of Northwest Europe. If it shows serious hiccups for a while due to decreased solar activity the average annual temperatures in North West Europe would drop overnight between 6 to 8 degrees C. The impact this would have on the relative small artic region is a multiple of this, hence the large excursion we witness in the Greenland ice sheet. Most of the harbors in Europe would freeze completely during Winter time. These simple facts seem to be completely disregarded when studying events like the Younger Dryas. Thank you very much for your reply Mario. You are of the opinion, then, that the quick melting of the Laurentide Ice Sheet does not present a so-called “energy paradox” that might be understood as a result of a large solar outburst (enormous CME) as per Robert Schoch as well as Doug Vogt? I know Randall Carlson has looked in the direction of a meteor impact and I agree with you that is very unlikely. What I think is most informative with Carlson’s ideas is the evidence for a truly massive meltwater scarring across the northwest states of the US. Also indications that a large portion (but not nearly all) of the ice sheet melted in as quickly as a matter of days. Most probably not. The first thing that researchers who believe in a CME would have to address before jumping to any conclusion would be the match between eccentricity and the occurrence of ice ages. They are one on one, and nothing else is. The second thing would be the reason why the Greenland ice sheet is still there, why would it be untouched by this alleged massive solar outburst? The third thing they would have to address is why the Greenland ice sheet was the central region of the combined ice sheets (Laurentide+Greenland+Eurasian)? The fourth thing they would have to address, is why is the Greenland ice sheet there at all? There are probably many more things that need to be addressed but these are just a few of them. Sure, there were spectacular melting events that were catastrophic but certainly not within matters of days. This process takes millennia, and that is one of the main reasons that so much evidence is gone – the time scale was immense in combination with the size of events that was also immense. The melting of ice sheets within days sounds spectacular and thrilling but that is impossible. The heat of fusion simply prevents this. It would take the sun hundreds of years to melt the Greenland ice sheet alone if ALL the solar energy that hits the earth’s surface would be dedicated to melt the Greenland ice sheet alone. Number rules the universe. Describing spectacular events as alleged facts based on certain observations, and not looking broader, are good for drawing attention, but if you perform calculations you see why this is untrue. Of course, you could try to argue that a CME would be thousands of times more powerful than the sun’s current activity, but then please show me the evidence for this claim. It is nowhere present, not in a single ice sheet. And if it would be a massive solar outburst, which was thousands of time more powerful than the sun’s current activity, how would the planet survive this? What would happen to the atmosphere? To the plants, animals, and all other life? There are extinction events, but how do they relate to alleged CME cycles? Where is the evidence to keep up the claim? How would such an event look like in the Antarctic ice sheet? Question: In discussing poles movement, sometimes it sounds as if you are saying Greenland moved over the pole, but it seems to me that you are trying to say that the pole moved over (through) Greenland. That would make a lot more sense as it would “fit” all current theories of plate tectonics and how Greenland as “moved” over the past 400,000 years. It would also match your animation comparing the spin axis of the earth and the relation of the extent of glaciation during the last ice age. I would not see it affecting the thought of Antartica being at the “south pole” as all south poles to your north poles end up on Antartica except for pole V which ends up not too far off the coast of Antartica. Comment: It is very interesting (I do not think it is purely coincidental) that if one looks at the Becker-Hagens UVG grid system, all of your proposed poles match essentially exactly to line crossings with the exception of pole IV which you have at 64 degrees and the Hagen lines cross is at 67 degrees….For 5 locations to line up so exactly cannot be pure coincidence. Thank you for your comment, Kirk. Anyone with sufficient knowledge of mathematics will reproduce similar results. We are looking forward to serious attempts. Greenland was indeed “catapulted” over the spin axis while the spin axis on Antarctica hardly changed position. That is no mistake as seen from our perception. It is the 1% mass of the crust that has been deformed over the 99% mass of the inner earth layers, hence moved Greenland over the spin axis and not vice versa. The spin axis of the earth as a whole does not change significantly. Crustal deformations, changes in crustal mass distribution, might have caused some additional wobbling on top of already present woblling. The latitudinal movements of the Northern spin axis is imprinted in the ice sheet of Antarctica as a proxy. The closer the samples are taken to the South pole the better. Vostok is one of the best locations for that. Any changes in the location of the Northern spin axis relative to the southern spin axis will be “registered” in the ice sheets on the southern spin axis as a temperature mark. That is because both poles are very sensitive to temperature changes due to their relative small area. In this article we have explained some of our ideas how this disproportionate displacement could have been caused. In combination with a high eccentric orbit, which caused large (on an annual basis) gravitational oscillations, we might have found the mechanism for crustal deformations other than the classical plate tectonics. Plate tectonics alone does not sufficiently explain this mechanism. Plate tectonics does not even explain geology’s own isochronic ocean floor map. We propose the massive deformation is caused by cycles of “growing pains” in combination with high eccentric orbit. This combination “knocks” the crust out of balance and causes deformation cycles over periods of tens of thousands of years. The Becker-Hagens UVG grid system indeed matches almost the poles I, II and III and V. The grid does indeed not match pole IV. It must be said that the Becker-Hagens UVG grid system is quite dense which means that it easily matches anything we are looking for. It is nevertheless interesting indeed. A 4 out of 5 match (80%) is relatively high and it looks to be too coincidental to be unimportant. The Giza pyramids were my entry point as well. Perhaps it makes sense that the author is using the pseudonym of “Mario Buildreps” as intellectual persecution is still alive and well. Four months ago, all that the Giza pyramids were to me were giant stone structures and a memorial to hard labor, then I learned about the internal structure and began doubting the mainstream beliefs and found myself going down this hole. I’m a software and hardware engineer. The internal structure of the Great Pyramid of Giza strikes me as a tuned resonator. ST’s application note AN2867 explains the math being doing the tuning in an electrical circuit, but I believe forms a starting point for research into the configuration of the structure. I make no conclusions, except that I believe that what we are taught lacks credibility. Most alternative theories have also been easy to refute, but those on this site have occupied me for months, attempting to replicate the research and develop a system to take all structures of unknown origin, test those, and ensure that the data on this site wasn’t cherry-picked to support the author’s theory. Exploration of the Great Pyramids by Howard Vyse and J. Perring were made in 1837. For perspective, Richard Owen didn’t realize that dinosaur fossils were from extinct critters until 1841. The modern views show all ancient structures as being less than 6,000 years old. The irrefutably and general acceptance of evolution and the earth being older than 6,000 years (something that was rarely questioned until people starting seeing dinosaurs in museums all over the world) allows us to reach back and question the ages of these structures. The political issues still remain regarding archaeology and anthropology, being largely western sciences and the power of western religions during the times of these theories drove funding and publication, and adherence to those theories grants power to the professionals in the field. Power structures, especially corrupt ones, rely heavily on being known as all powerful and all knowing. In such cultures, speaking out against what the authorities state is absolute and known may as well be sedition. The Great pyramid was built, primarily, to last long* enough to communicate its message to civilisations who would be able to understand and have need of that message. This message is so important to h sapiens it is encoded throughout mankind’s culture (mythology, etc.). You will even find the same essential message in the Lascaux cave painting: http://news.bbc.co.uk/2/hi/science/nature/871930.stm (depicting the celestial gnomon: Pleiades->Taurus->Orion = Sirius [ http://theopenscroll.com/images/symbols/celestialLocationPleiadesSiriusOrionBelt.jpg ] ). lat/lon/tc(true course or angle) are in radians and distance is radian distance (distance in nm*pi/(180*60)); 1nm is approximately 1 minute: earth’s circumference is approximately 21,600 nm, or 360 * 60. The formula listed shortcuts 2*pi/360 as pi/180. Thank you for your interesting comment and your verification work, Alan. How many structures did you use? Can you provide a link to your pics? I’ve only used a handful by name that were listed on your site that I picked at random to verify your data. I don’t have pictures; the software I wrote generates KML files that I would dump into Google Earth. While I know the accuracy of measurements on the GE imagery isn’t exactly LIDAR, it was sufficient for my purposes of verifying your math. There are a lot of bogus websites out there with all sorts of outrageous claims where the math fails and before subscribing to your theories I wanted to verify your math. I am getting the same results as you. I started by entering a few of the Chinese Pyramids, The Pyramid of the Sun at Teotihuacan, Tel Afec and Edzna, visually identified the intersection point over Greenland. I then measured the distances from the current North Pole to the Khufu Pyramid and drew a line of the same length as that measurement, following the line from the Pyramid of the Sun and the end point was inside of the cluster of intersecting lines. I also have a theory on how to quickly aggregate data from the OpenStreetMap database to quickly approximate points. I haven’t tested it yet, but there are tags, such as “ruins” that could be used to help find ancient structures. The thought is that all structures that have a side that points above a certain latitude could be initially included. Buildings built in recent history might leave too much static, but the thought is that a scattering of the intersecting points should yield hot spots in your former poles. The math for determining intersecting points rapidly should be computationally feasible. Thank you for your comment, Alan. Very interesting what you are doing. We are pleased to hear that you try to verify our research. It could be so that the distance between Giza and pole I, and Teotihuacan and pole III is the result of coincidence. But it is a very awkward result and on top of that are the bases of Khufu and Teotihuacan’s pyramid of the sun also similar. Do you have any means to publish your results? If so, can you leave us a link to your results? I am still working on things and have been very busy with work. I had to purchase additional SSDs to load the newest version of the data and the initial load finished this morning. I will keep you updated and I am still very much alive and working on this. I did write a website that enables extrapolation and generates KML based on a coordinate and true course to draw the lines, but I don’t yet want to publish it to the world. Hi Mario, amazing ideas that really inspire thought – keep up the good work – can’t wait for the book! I wondered if there was any update – increased/decreased confirmation of Pole Vl. Hi Peter, thank you for your comment. The book is in progress and will still take some time to complete. We cannot prove Pole VI yet, unfortunately. I cannot wait for your book to come out ! Moon phases are pretty complicated, and we have called the extremes Lunastices. There are no diagrams in the article of the moon phases, because that is useless. Stonehenge was pointed towards Pole IV hence it was located at another latitude, between 63 and 64 degrees latitude. At this latitude is there a phenomenon indeed once in every 18.5 years that is called the Major Lunar Standstill. At these occasions are the Lunastices more extreme than usual. At Stonehenge’s original latitude (between 63 and 64) was there an unusual phenomenon to be witnessed; that of a moon that circles around the site without setting completely. The latitude just below the polar circle is still a latitude where this happens every 18.5 years and is the lowest latitude where this can be witnessed. Hello again Mario. Thank you for your informative response to my question on Hotspots. If I may, I have two further questions. You have observed that the pole position over Antarctic has not moved to the same degree as over the Arctic. You also commented that you believed this was due to compression in the Atlantic and stretch in the Pacific. Now my questions: Firstly, how far and in what direction do you believe the Antarctic Pole shifted in the last 350,000 years? Secondly, could the compression in the Atlantic have been caused by the Eurasion Plate sliding under the African plate, or vice versa? If the answer to my second question is yes, this could explain the disappearance of Atlantis, if indeed the city was located west of the Pillars of Hercules, as asserted by Plato. Your thoughts on these matters. We currently do not know for sure (yet) how to interpret the data regarding this topic. The North was very mobile, while Antarctica was fixed, that is very certain. More research is needed to find conclusive answers how and why the earth was deformed in this typical way. We suspect that the ideas of Atlantis were incorrect interpretations, as if it was one place or island, while in fact it was a global catastrophe over the course of many millenniums. Hi, I am curious as to how it could be that some say Antarctica was a lush liveable area as little as 10,000 years ago, does the data support a southern pole shift in any way? Hi Hakon, it is very unlikely that Antarctica was a livable place some 10,000 years ago. Antarctica hardly changed its position on the globe over the last half million years. The so called blue ice on Antarctica is over two million years old. The data supports no significant shifts over the last half million years. How does the Piri Reis map fit into this? That’s hard to say, it is something we haven’t studied. A map could be the product of someone’s fantasy, like the books from Tolkien. It could be something huge after all, but a map is similar as that of stories; they are hard to prove to be true. I’m fascinated by your article and work. I’m not a scientist but curious researcher of origins of humanities and ages of civilizations, including universal catastrophism theories. I fully concure with your estimates on the ages of archeological structures which appear self evident. However I also subscribe to earth’s unstable geology and abrupt disruption of climate, living organisms, and academic established norms of stability and uniformity of global established continuity of life and universal predictability. The Electric Universe (EU) is more compatible for planetary movements and solar cycles than nuclear and gravitational status quo. My personal question to you is how would you account for global catastrophic records in geological and glacial evidence of mass extinction events and global floods recorded in all those ancient monuments which you have studied? While I have read many stories related to global upheavals the one that has surfaced recently has a ring of historic truth in events descriptions that suggest sudden crust displacements of such magnitude that are more immediate than gradual polar displacements you have suggested. Here is new story I found from USA government called “story of Adam and Eve” that seems quite real and despite others confirmations from Russian academicians and EU. Thank you for your comment, Jon. To directly answer your question. If I understand you question correctly; everything is pointing to very slow changes of the crust. There are no earthly changes that take place overnight, except maybe an asteroid impact. These changes take place very slowly over a period of many generations, tearing down developed civilizations over a course of many millenniums back into a new Stone Age. Myths and stories of lost civilizations are born, memories are lost in the mist of time. The usual timelines of just a few thousand years, like the ones that we also see in this recently disclosed document, are not based on science. They are based on underbelly feelings which are fed by our conditioning that Homo sapiens started to built things just a few thousand years ago. Homo sapiens is around on earth for more than 400,000 years. It needs no brilliant mind to understand that Homo sapiens was as capable 400,000 years ago as we are today – it is simply in our species and does not rely on schooling or study. Studies make us more usable in the economy. Brilliant minds on the other hand are of all time. The secret services do not know much more than the general public and are groping on this topic as much in the dark as everyone else. Many of the material in this document is based on research of Charles Hapgood. I love the work of Charles Hapgood (who doesn’t? ), because it is original. But because his work neglects too much good scientific data it is unreliable. Most of his claims rely on just a few observations. Hapgood neglected the Milankovitch cycles completely. 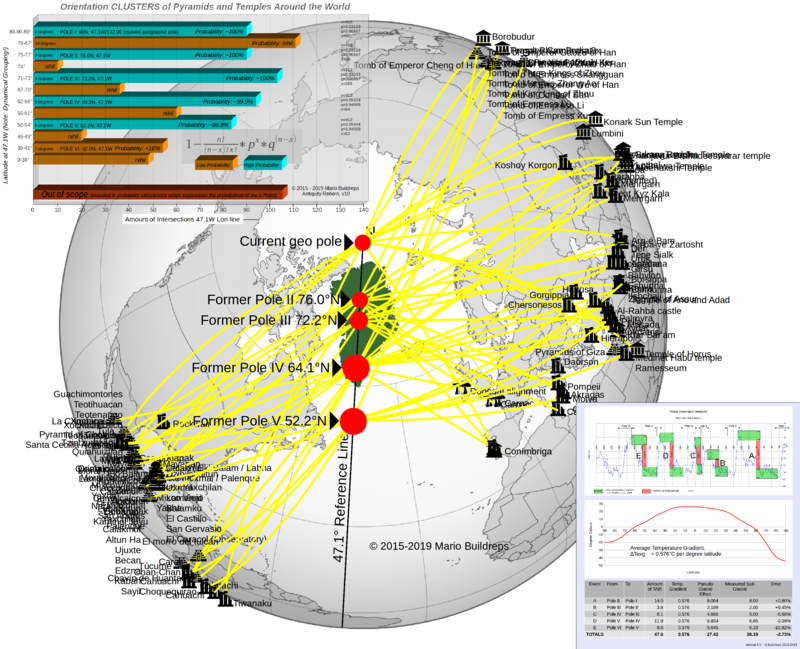 The ice core data from Greenland and Antarctica were not yet available. 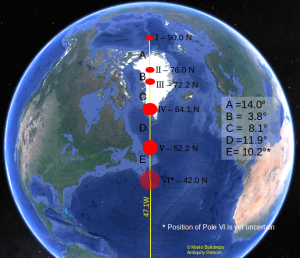 Hapgood concluded that the geo pole was at the Hudson bay and based his conclusion on magnetic pole movements. But if the crust shifts and the magnetic pole moves you cannot establish a correct position on magnetic pole movements alone – this equation simply lacks data. It is suggested by Hapgoods and other researchers that the crust would shifts within matters of hours, maybe a few days. There is no force present to make that happen. This timelines is simply nonsense and not supported by any well documented scientific data. The facts are that the crust has long periods of stability and long periods of instability. Well, there is a force present that can cause crustal shift, and global upheaval in a matter of hours. Every 12,000 years the Earth inverts its spin axis 180 degrees, and the crust may shift (by 10-20 degrees or so) as a consequence (as you observe, subject to a fixed pair of crustal pivot points). This is because the Sun is in a 24,000 year orbit about its binary twin, and as a consequence oscillates between two oppositely polarized magnetic fields. As The Earth becomes subject to the opposing field, it appears as if the Earth’s magnetic field is reducing, and its magnetic poles are drifting (at an accelerating rate). Eventually, and relatively suddenly, The Earth destabilizes and inverts, resuming stability for another 12,000 years. But, yes, there is no global warming or cooling phase (aside from a volcanic ash induced Fimbulvetr), and so ice cores should only infer a local temperature change, as opposed to a global one. This knowledge, and the moment of inversion, is thus well encoded throughout mankind’s culture, e.g. The Zodiac, the Vesica Piscis, the celestial gnomon drawn from the Pleides via Taurus, through Orion, etc. Hello Mario. Has any work been done on the movement of Hotspots along plates, to confirm or deny your theory? Hi Derrick, that is one of the many topics still on our list. There is some work done on hotspots. The most famous and clearest hotspots are those of Hawaii. The distances between the hotspots on Hawaii appear to follow the same sequence as our discovered pole sequences. The distances from Hawaii to Maui, Maui to Moloka’i, Moloka’i to O’ahu, O’ahu to Kaua’i are resp. of the same sequence as Pole I to Pole II, Pole II to Pole III, Pole III to Pole IV, and Pole IV to Pole V. The probability that the pole sequences, the glaciation sequences, and the sequences between major hotspots are coincidentally of similar size is very small. It is around 1 to 65,500 for these patterns to match all three coincidentally. We are certain that they are closely related and are thus related to the most recent glaciation cycles as well. This pattern of hotspot movement confirms our theory. The datings of the hotspots of Hawaii are probably incorrect, i.e. they are much younger. Geology presents conflicting data concerning the age of ocean floors (isochrons) and the dating of the hotspots of Hawaii, that why it is impossible for them both to be correct. 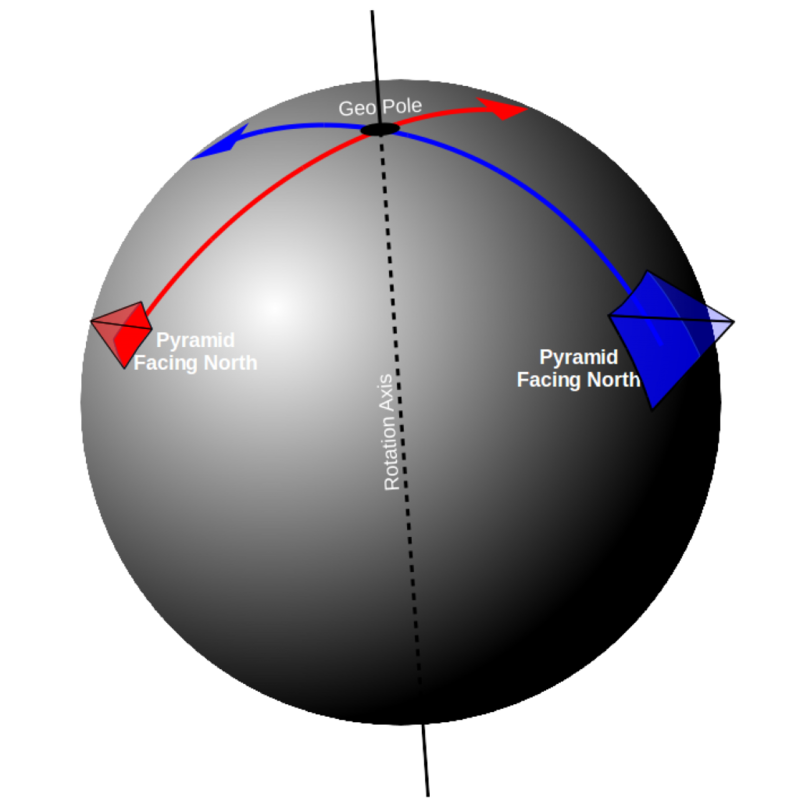 Not sure if the ley lines of the planet, of which seem to be a primary staple in regards to the pyramid location, are an accurate dissemination of planetary weather patterns. At most what this shows is that there is an electromagnetic commonality to the progression of how the planet rotates in relation to atmospheric conditions and solar activity. Does pole shifts alter this theory? Or do the travel patterns of the for mentioned pyramids shift in directions? Crossing over one another in a longer sine wave like rotation? Hi Roman, we know that the ley line ideas are very popular among some alternative researchers. But these ideas are not well documented, not well researched, and are mere ad hoc visual observations. Most ancient structures are simple neglected in these researches. We do not agree with the idea that ley lines, “electromagnetic commonalities” and pyramid locations are what you call “accurate dissemination of planetary weather patterns”. We have done some research to the phenomena and found no connecting data. Yes, you can “connect the dots” if you neglect 95% of the other ancient structures. But that is of course no good research. No, it does not effect our research in any way. It has nothing to do with each other. Please show us one well done research supported by data and probability calculations that your assertions are accurate and maybe even true. Packing ideas in nice phrases and using fancy words does not mean ideas are necessarily true. Why do you give so much importance to “academia”? University was invented in XI century, it is a medieval invention, a medieval thing with proud of been medieval. Non sense and idiot theories are the tradition in “academia”. Why don’t you calculate the % of wrong theories in the group of all “academic” theories in history of “academia”? With that numbers you will see the real value of “academia” and “academics”. “Academia” had the monopoly of access to the existent knowledge until internet came. That monopoly do not exist any more, we can see and learn your theory without approval of “academia”. Why do you insist in that medieval institution already outdated? Without the monopoly of knowledge everybody can see most of academics are simply morons, as their theories show, and % of wrong theories of “academia” demonstrate. So please explain your theory without these omnipresent looking for approval of “academics”. Forget the “academics” remember the ridiculousness number of wrong theories accepted and used by them. By the way, if the “academia” accept your theory as true the probability of that theory be wrong is much more higher, as you can see in the ratings of true theories of “academia”. So many bits and pieces, I am very interested in having the puzzle pieces fit together. Michael Steinbrenner has a video posted to the electric universe which as merit. Brian Foerster has a video regarding the high Inca and pre-Ince structures in Peru. Archeoacoustics are dealt with in a video on Megalithomania by J Swagger. I’ve heard W Brown’s theory of Hydroplanes read by B Nichol. I’ve read More Than 60 Minutes by TS Niazi regarding Earth’s acquired outer core magnetic field. I am leaning toward a global dust cloud of massive magnetism enveloping the Earth disappearing the Moon for some time. This dust cloud settled on the Earth becoming a new lithosphere of small-grained granite, particularly in areas of highly magnetic rocks. Across the world early humans had to continually excavate their well water source producing the deep sacred wells of India. Ancient rivers disappeared forcing the humans to relocate. Did we draw this magnetic dust from a magnetar? Was it created by a plasma strike where energy>mass>matter? Did a sound wave shock the coatings of the pyramids to dust? Is this secondary lithosphere the reason we have deep earthquakes in the original surface that transfer to the upper surface? Did the dust create new continents in different areas but of the same shape as RobertYeahright’s video suggests? Has the magnetism once present in this dust now degraded indicting our lost knowledge? Lastly, the ancient Egyptians invested strongly in the preservation of Ba and kA which was unknown and unpracticed prior to the Old Kingdom which points to the time of a global catastrophe as Firestone, West, and Warwick-Smith suggest in their book the Cycle of Continuing Catastrophes. Hello Mario, I have read your research carefully. I agree largely with the same ideas, but I wonder if in reality the orientations of the different pyramids are not really based on a certain specific latitude. For example, Chichen Itza is the 22nd run of the axis and therefore, should not we assume that the pole could have been anywhere in the 68th parallel? I think that the orientation of the different monuments may be related to a polar displacement, as you well indicate, but why not assume that what these ancient monuments actually indicate is the parallel where the pole used to be? Hi Mariano, thank you for your comment. I do not understand what you mean with your example of Chichen Itza (22nd run and 68th parallel). I understand your reasoning and even your doubts maybe about our method. When you take a few steps back and look at how the (currently) 591 sites and monuments are oriented we see that on the Western hemisphere they are largely clockwise oriented (fig 7) and on the Eastern hemisphere they are largely counterclockwise oriented (fig 8). The probability that this is a coincidental configuration is zero percent. They apparently converge to a certain path. This path appears to be at 47.1W and runs over Greenland of all possible locations on Earth. The rhythm between the nodes appears to be following the rhythms of the ice ages. In other words there are no assumptions in our method, we only follow what the data tells us. Excellent insights in a world of interesting probability. More people should know about you and your work. As a visual artist may I suggest a different set of colors for the lines to the Cardinal Structures differentiating each pole shift, for clarity. I find that all you say math implies, is inspiring. Thank-you for sharing your world view! Thank you for your comment and your suggestion, Tom. Hi Mario. Your work is beyond fascinating. For those who understand statistics and correlation, what you’ve done is convincing. I read this paper and immediately thought of your work. In this paper it is shown how the solar polar magnetic fields are related to earthquake activity, and that during times of sunspot minimum like we are right now, electrical input from the solar environment causes the crust to move. I wonder if what they’ve discovered provides the causative forces you’ve identified in the movement of the crust. Hi Pete, thank you for your comment and the encouragement! There are indeed relations between solar activity and earthquakes. We have found a one on one relation between eccentricity and crustal deformations. The driving force is oscillating gravity. Can I please get a link that explains the mathematics behind the oscillating gravity phenomena? I want to understand the detailed physics behind how an eccentric orbit modifies Greenland’s crust. There is no link. It is one of the inevitable conclusions of our research. It is not even very difficult. Eccentricity is the only phenomenon that correlates with glaciation cycles. Eccentricity comes with much gravitational variation between the revolving bodies. This gravitational force (from the sun) is an external force that interferes with the rotation of the rotating earth. The lightest part of the earth that also rotates the fastest, the crust, reacts the most violent on this external force and starts to crawl and deform in a direction that is perpendicular to the direction of rotation. This motion is of the same principle as that of a spinning top but then more complicated. The crust starts to deform unequally because some parts of the crust are more firmly connected to the inner layers than other parts. This process of one deformation cycle goes very slowly, for instance from pole III to pole II, takes place over tens of thousands of years. It is a mystery why mainstream science with all their budgets and clever minds hasn’t found this out themselves. We are, with this new discovery, decades ahead of mainstream science. I just saw a program on the Baltic sea island “Bornholm”, and the alignment of the various churches built during the 12th century, but based on older information. Have you ever looked at the data? One of the churches was out of total alignment by 11 feet. Any info you have would help me. It was associated with “holy blood holy grael” and the templars. The Templars did a lot of digging in the middle east around Jerusalem and I wonder if what they found there was of significance. An example was the formation of pentangles and the mathematics show that they knew the circumference of the world (world being round), when all thought the world was flat. Hi Jim, thank you for your comment and your support! Much appreciated. The island of Bornholm was once covered with the massive Scandinavian ice sheet. If there were ancient ruins of before the ice ages they are most probably crushed. The crust became stable around 26,000 years ago while the ice sheets retreated from that region around 12,000 years ago. It seems therefore very likely that all foundations are younger than 12,000 years. The Templars knew some of the secrets of the ancient world and that they have found artifacts of interest is beyond any doubt. They took it with them and locked it away in the dungeons of the Vatican far away from preying eyes. Olá Mario Buildreps, sua informações são excelentes. Me autoriza copiar suas informações, e no vídeo que eu fizer, vou colocar na descrição direcionando para sua página. Aguardo sua resposta, caso SIM autorizando, desde já te agradeço, SENÃO, sem problemas. Different authors have interpreted these time spans in different ways. In the Satya Yuga, humans were gigantic, powerfully built, honest, youthful, vigorous, erudite and virtuous. Everybody was happy and saintly. There was no agriculture or mining. In the Treta Yuga, emperors began to conquer the world and agriculture and mining started. In the Dvapara Yuga, the average lifespan decreased to a few centuries. People had diseases and fought with each other. We are now in the Kali Yuga (since the year 3102 BCE), and the lifespan falls to only 70 years. It is the age of ignorance and darkness. People have become sinners and lack virtue. The environment is polluted, water and food become scarce. Family bonds deteriorate. At the end of the Kali Yuga, humans will have a height of only one meter. So, the Vedas are also talking about human beings living on Planet Earth since a very long time. And civilizations rise and fall, presently falling. I have read one author hypothesizing that perhaps the australopithecines were survivors of some previous Kali Yuga, thus only one meter in height and diminished in intellect. After each 4-Yuga cycle, there is a major cataclysm before the cycle starts again with the Satya Yuga. And between each Yuga there is a minor cataclysm. I find that your theory fits very well with the ancient wisdom of the scriptures. If modern mainstream science was more sophisticated and if scientists would leave their dogmas behind, then they would discover that the ancients knew it all along. Thank you for your comment, Sophie. When it comes to Yugas there is only one reliable source: Yukteswar. Yukteswar explains in his book “The Holy Science” why the Vedic texts went wrong with their time frames, the time frames that you mention here. Yukteswar’s proposed cycles are in line with the precession of the equinoxes. Yukteswar’s book is not easy to read but contains tons of precious information. I would like to add one correction here: the time scales rejected by Sri Yukteswar are found in the Puranas, not the Vedic literature. The Vedic literature comprises the Vedas, Aranyakas, Brahmanas and the Upanishads (the Bhagavad-Gita is considered an Upanishad), whereas the Puranas were composed after the birth of Jesus. Personally speaking, I agree with everything he said about the Yuga cycles, except their time scales, which I think is 2700 years every Yuga, followed by a 300 year gap between two consecutive Yugas. Hi Rajat, thank your for the correction and the addition. Your comment very interesting, but if the eccentricity is the ONLY variable creating our past geographic pole movement, wouldn’t science do just what it is doing now? Ignore any cycles, but use the information in economic planning to maintain superior control of the population? They wouldn’t care about planned births or population levels as they would expect end-time cataclysms to reset to near zero and bring the recycled onset of low population? Speaking of low population, bear in mind we are a nuclear society with no way to reduce the deadly radiation, so why assume there is a cycle when it is actually humanity’s tech itself that destroys itself? MB, I have been on a recent quest for information that has taken me to the theories of Velikovsky, Sitchin and Hapgoods. Regarding Hapgoods theory of crustal shift resulting in pole shifts. As I understand it He concentrates on the scientific proof for the mechanics of crustal shifts for which he had a (partial) endorsement by Albert Einstein) but I haven’t got as far as to the reasons why or how he positioned the previous 3 pole locations other than carbon dating of vegetation found on iceland(?). The locations he has for the pole seem more ‘circular’ as opposed to your longitudinal direction and the timeline more compact, 4 shifts in 80,000 years as opposed to your 100,000s yrs. Have you considered his theory and data when developing your methods? I have to admit to being overwhelmed by the amount of theories and information that is emerging at the moment, you have to wonder if it is coincidence or something else. It is clear that past civilisations had a much more superior knowledge of the stars, solar system and The Earth than we gave them credit for. There is one question that I always end up asking myself. In antiquity, if people developed their knowledge by observing the night sky then they must have been observing for a minimum of 26,000 years to account for a full precession cycle, or have I missed something? Hi Terry, we are aware of the theories as produced by Velikovsky, Sitchin and Hapgood. It was Hapgoods ideas that inspired me to do serious research into this topic using all modern data that is available to us. Hapgood made a few errors in his research; 1) the assumption that large bodies of ice cause crustal displacements and 2) he used paleomagnetic data and carbon dating in his research. Ad 1) large bodies of ice always form around the spin axis. When land around the spin axis is asymmetrical the main ice mass will be asymmetrical as well, so indeed a centrifugal force is born. Hapgood suggests on his ideas a few displacements within the last 100,000 years in all sorts of directions. He is clearly onto something but his movements are too abrupt to be taken seriously. Ad 2) Hapgood used also paleomagnetic data to determine the spin axis positions. It’s easy to see that this is highly incorrect when the magnetic pole has moved all over the place in the last 80,000 years. All conclusions are then inaccurate and even incorrect. Sure, there is a lot of hocus pocus around on the internet about ancient history and ancient civilizations. But who has more data than us? In fact, we are the first to have combined all the data available today into a bigger picture. About precession cycles. How has modern science determined with high accuracy that a full precession takes almost 26,000 years? The only way is to use observations and mathematics, and that is something our ancient ancestors knew how to use as well. There is however as far as I know no public data available that show the observations and calculations how modern science came to the conclusions of such cycles based on observations of only a century or so. It’s not unthinkable that new discoveries in this field will be made in the coming decades. MB, thank you for your reply; separating the wheat from the chaf of credible information is a task but what evolves is an element of each theory that provides a credible story. However, no matter which way you look at it they all require a good run of observation and knowledge which your method provides. Thank you. Thanks for your reply to my comment on the The Secrets of Stonehenge – An Ancient Message video. There are many positive comments here, and in all your videos; I applaud your wise yet always courteous responses. We can all see, you really are sitting on a massive discovery and will likely have to tread on a difficult path to get that ultimate and final recognition for it. Not sure if you mention this in the website yet but if I may, I would like to ask a question related to the moons equivalent word for Solstices. In the video The Secrets of Stonehenge – An Ancient Message, the word “Lunsastices” is used to describe the moons rising and setting motions. What I do not understand is why this word does not appear in the online OED, Websters or even Google. Yet I see the word referenced in other texts online relating to “the lunar standstill (lunastice).” Which, is exactly what Google refers to. Hi Bill, I understand your confusion about Lunastices. A Lunastice is for the Moon what a solstice is for the Sun. Lunastices and Lunar Standstill are somewhat related. During the Lunar Standstill is the Lunastice extreme. Hi Mario, I had never seen that word before until I saw the video and actually paused to look it up. This is where my confusion comes from – It’s not a word found in the most authoritative dictionary. My problem is trying to understand how we can have a word clearly used by the archaeology community et al, that isn’t in a dictionary. Here, it is spelled with an i and not an a…. but the waters get even muddier when, whether it is Lunistice or Lunastice neither are in the Oxford English Dictionary or Merriam Webster online. Indeed, the-free-dictionary web page includes interesting citations and also a reference to Wikipedia under the small USA flag for word pronunciation. When you click Wikipedia it takes you straight to a spectacular page about Lunar standstill. Never mentions lunistice again. The ONLY reason I even highlight any of this is purely for your information to use in staving off those often loud mouthed individuals who love to pick holes in anything just for the sake of it. I just imagine somebody saying, “oh look they are using fake words – ahhh the whole thing must be fake”. None of us here wants that to happen! In the immortal words of Forest Gump – that’s all I’m going to say about that. Hey, Mario. I think your theory has some merit. Would you post on this site the entire list of monuments so others could test your methods. I like your graphs, and tables, but its better for some of us to have the raw data. Thank you for your comment, Carl. It is privately funded work. If it would be publicly funded you would have a point. You can read the conclusions for free on this website. Why would we also make the data available for free? Waiting pensively for the book…any date yet? I believe this information needs to be in libraries everywhere. Let’s do that before it’s to late…all the best. Firstly, is there any way to slow down your map showing the poles, so I can read the temples associated with the various poles. Secondly what are your opinions of. Puma pumku is of interest to me, it was this site where it was said that the builders got it wrong as to the cardinal points. Do you have any theory as to the rapid melting of the ice sheets, or did they melt because the pole shifted to a warmer clime. Thank you for your comment, Jim. Yes they can be slowed down but that would take away the helicopter view. In time there will be a list of sites, and if you want to have more details you can go to this paper we have published. You will find a long list of Latin-American sites with their GPS locations and orientations. Regarding the researchers, I believe they are all sincere researchers, they all have a better understanding of our ancient past than mainstream archaeologists have, although they still lean too much on speculative assumptions. About Puma Punku, the builders were not wrong about the cardinals, on the contrary. The ages of this site are off the scale. Kalasasaya is built in two stages, the oldest, the outside perimeter is most probably around 26,000 years old. The geographic South pole is much more stable than the geographic North pole, although it moved much less than the geo North pole, and that is the reason why we see a correlation between a slightly clockwise orientation as the site is covered with more soil. We are working on dating of Tiwanaku. An exact age of Puma Punku is hard to pinpoint. We have found evidence for its age to range between 450,000 and 600,000 years. You also asked something about Marcahuasi and Ruzo’s work on it? We have looked into this site superficially. They are probably too ancient to be dated accurately. Think of terms of millions of years. I have come across a few sites where the historians say that the site is not aligned to the cardinal points and the builders were obviously inaccurate with their calculations for the time frame attributed to the construction. Could it be possible to calculate the date from their actual orientation. Also there is a lot of gumph about a coming polar shift. Is it pole shift or crustal displacement that shows up as pole shift. Ancient builders were not ignorant from the ancient cardinal directions, far from it, their calendar and time system and thus their survival was depending on it for crucial things like sowing and harvesting. There is a lot of nonsense about pole shifts and that doom is coming soon, or that the latest pole shift took place within matters of days. No wonder that scientists are laughing at these “theories”, if it’s even worth to call them a theory. It are ideas lacking sufficient data. There probably won’t be a pole shift, neither magnetic or crustal, within the coming centuries. Our future generations however will see an increasing seismic and volcanic activity. Fantastic article, very informative. I wonder why the other experts of this sector do not notice this. You should continue your writing. I am confident, you’ve a huge readers base already! MB, I am fascinated with your theory, I look in regularly since I discovered it a few months ago. I’ve struggled for a long time with the standard explanations we have been fed from scientists and religious leaders. I came across the Electric Universe theory, which again challenges everything we’ve ever been told more recently such as ‘The Big Bang’, black holes etc. I’m not qualified to challenge ‘The Theory of Everything’ but I have never been comfortable with it, it is easier to understand that the universe has always been and that it is almost like a living entity of which parts of it are born, die and then reborn rather than once there was nothing from which everything burst into life. However back to your theory; If you accept that the Electric Universe is a possibility and that the devastation of plasma exchanges between planets happened during planetary changes in orbits (something NASA have mentioned in the past when trying to explain the strange orbits and position of our solar system) with the potential to lift, move and in parts destroy the crust, could this explain the changes in orientation potentially over a shorter period of time? I am a fan of your theory, and I believe our civilization has been on this planet much longer than we are told, but there is something in this EU theory that we can’t ignore. Thank you for your comment, Terry. Maybe we will join forces with other researchers one day. The idea of the Electric Universe is very fascinating. Our main interest is the origin of humanity because to really understand where we came from lifts many veils. I couldn’t agree more; History and humanity (the species & origin) is far more complex than the historians would want us to believe. I would be fascinated what the likes of Robert Schoch (sp?) would think, particularly as your and his date for the Pyramids and Sphinx are in the same ball park. Thank you for this and keep up the excellent work you and your team are doing. That comment about plasma strikes in the northern hemisphere made me consider the possibility that was the reason Greenland was bare of ice 200 million years ago. 5 million years ago the Mediterranean was dry for 1/2 million years. IF our sun was the source of the energy that affected the Earth in its orientation, could not the plasma have added energy>matter>mass as to increase our Earth in size? Also H2O? I guess moving north pole means expanding earth. During the Ice Age the earth rapidly expands. I think that the rotation of the earth is a Faraday motor with magma of the Pacific volcanic zone as the core. The Mariana Trench, Kuril Islands, Aleutian Islands are distorted terrain in an arc shape. This is a trace that the underground magma was dragged in the direction of rotation because the North Pole shifted every ice age. I appreciate your wonderful research. Thank you for your interesting comment, Kazunori. You are probably right in your conclusions and observations, we are still studying on the patterns before we can publish more on this specific topic. If it is true that the rotation of the Earth is a Faraday motor that would explain the wobbling of the magnetic field which in fact never flipped entirely. The combined patterns of magnetic wobble and crustal deformation could explain an alleged flip of the magnetic field when assumed the crust is almost static. Thank you for your reply. The earth’s magnetic field is not inverted. What is considered paleomagnetic is a trace of relatively new ground current. The magnet has the phenomenon of demagnetization. It is a phenomenon in which magnetism is gradually lost. After 10,000 years most of magnetism will be gone. There is an article written about the earth. Please read it. Awesome thesis. I will be sure to do a follow up on all these fascinating points. Thank you for enriching my mind. Hi there, just became aware of your website through Google, and found that it is really informative. I’m going to watch out for more. I’ll be grateful if you continue this in future. Lots of people will be benefited from your writing. Cheers!